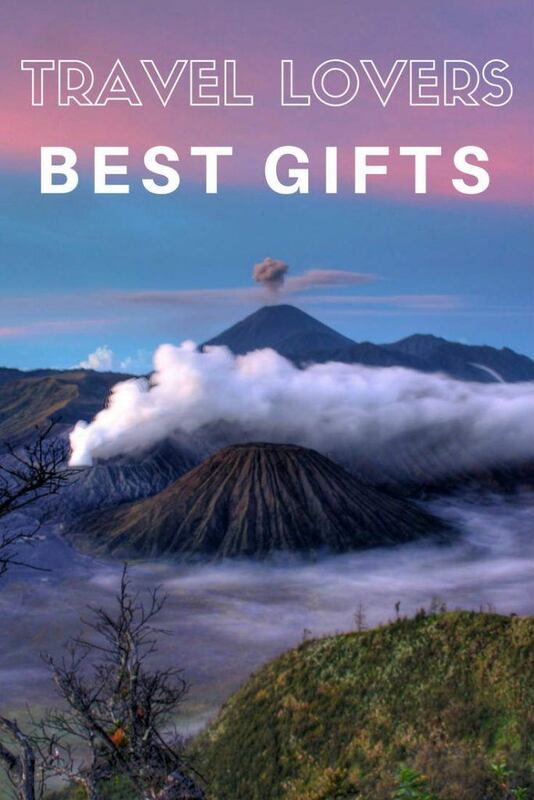 Are you looking for the perfect gifts for the travel lovers in your life? 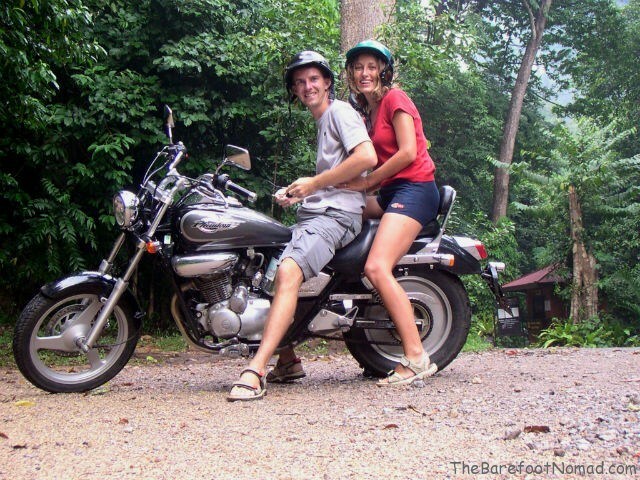 In the 15 years we’ve traveled together, and the eight years we’ve blogged on The Barefoot Nomad, we’ve had a chance to road test quite a few travel gifts. 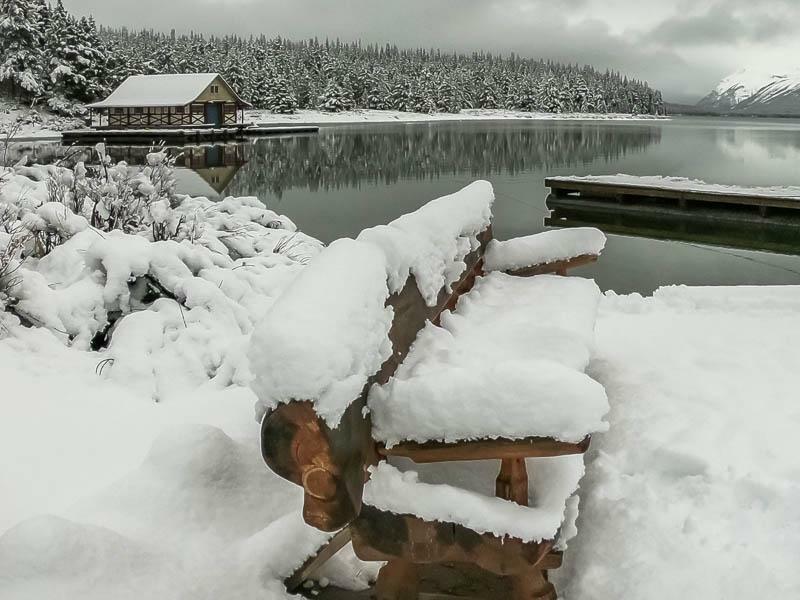 Some have been instant hits, like our GoPro HERO 6, my SCOTTeVEST travel jacket, and packing cubes. There have been some duds as well, but we’ve left them out so we can concentrate on showing you the best travel gear out there. Here they are: our very best gifts for travel lovers. 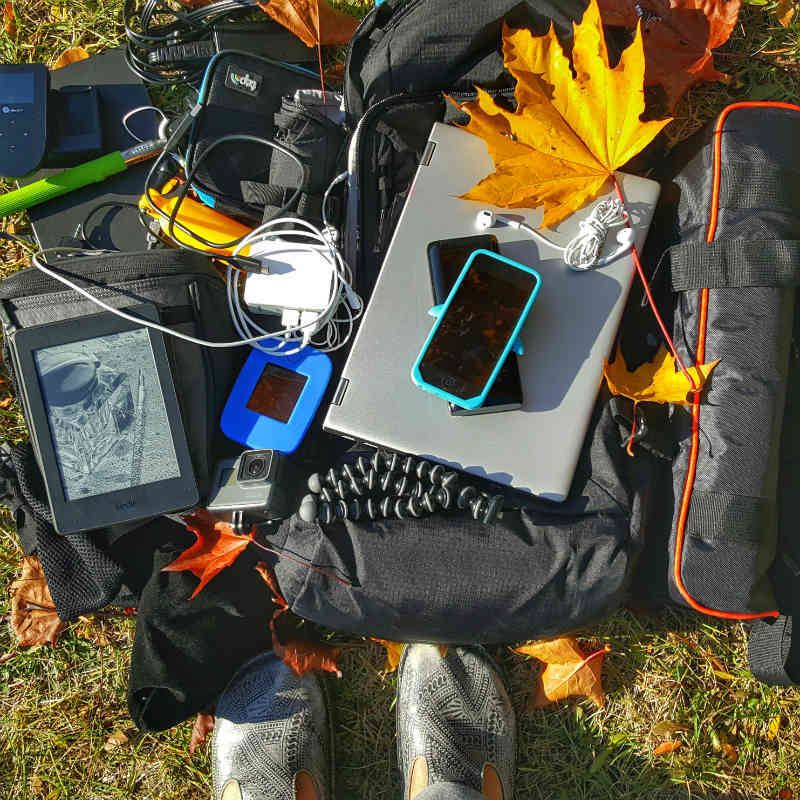 We’ve traveled with our Tep for well over a year now, and it’s now an essential part of our travel kit. For just dollars a day, we can get WiFi almost anywhere in the world. Even better, we just pay for it when we need it. Check out our in depth review. Would you love to learn a new language? We’re learning Spanish, and it was incredibly useful lately in Mexico, Columbia and then Ecuador to be able to easily order at a restaurant, or understand bus and plane schedules. To get started, you can download Rosetta Stone and learn to speak the language of your choice in your own time. Live online tutoring sessions and online learning games make it fun, and you can choose the program that’s just right for you. Subscriptions come in 3, 6, 12 and even 24 month packages, and you get the flexibility to learn another language on your schedule, with any device, from anywhere in the world. You can even download lessons to your mobile device to continue learning offline. Want to try it out first? Click here to try the Rosetta Stone Free Demo . Get your online subscription here, and learn from anywhere your mobile device takes you. 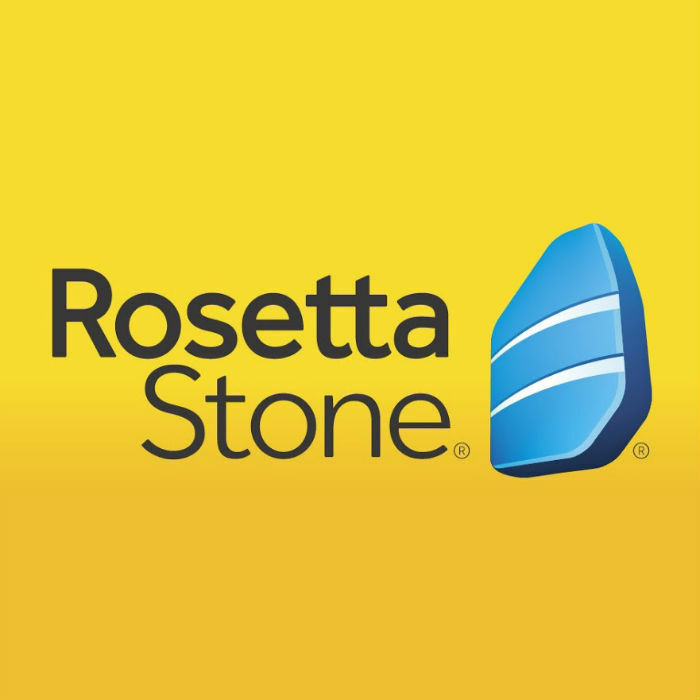 Follow Rosetta Stone on Facebook, Twitter, or YouTube. We just picked up our GoPro HERO 6 a couple of months ago, and we’re loving it. Unlike older GoPro models, there’s no case to snap on and off. It’s waterproof as is, and it takes gorgeous 4K video and photos. See our sample video here and our tips for taking great family photos and videos! We’re Canadian, so we picked our GoPro HERO 6 up locally from Sport Chek, but they’re available almost everywhere, including Amazon. What’s a GoPro without accessories? The GoPro is made for action, and it’s the perfect little camera to bring in the water. The problem is: it doesn’t float. We use a bobber floaty for it in the water, and it keeps it from sinking to the bottom or getting lost in ocean waves. Buy the bobby floater on Amazon. The GoPro can also use a bit of battery life if you use the WiFi feature, so it’s helpful to have a second battery always charged. Buy it on Amazon here. We also love our Joby Gorrilapod for getting great shots. This version comes with an adapter for the GoPro. Buy on Amazon. If you’re looking for a bunch of other accessories, we’ve had great luck with this inexpensive after market BAXIA TECHNOLOGY 44-in-1 kit that’s chock full of accessories like a chest harness, head strap, and plenty more. Everything we’ve tested from this kit has worked with our older GoPro 4 Black and the GoPro HERO 6. See it on Amazon. Packing cubes honestly changed my life. No more digging through a suitcase to find that last pair of underwear, and no more dirty laundry accidentally jumbled in with the clean. 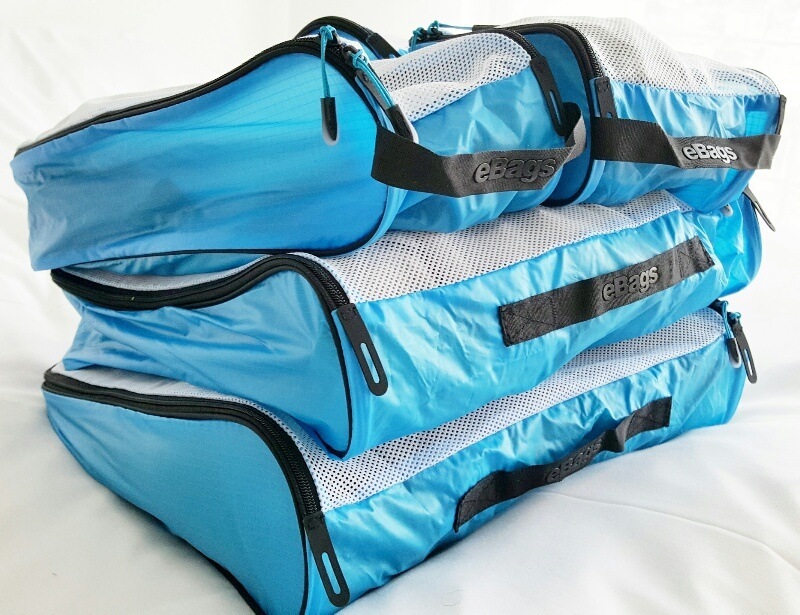 We use eBags ultralight packing cubes, but they’re a bit expensive (though incredibly lightweight and durable). If I was buying packing cubes again, I’d seriously consider the Amazon Basics sets, which get stellar reviews, and look similar. As a family of four, with two kids, we’re constantly struggling to keep our travel gear as light as possible. However, as travel bloggers, we need a DSLR for good quality photos and video. 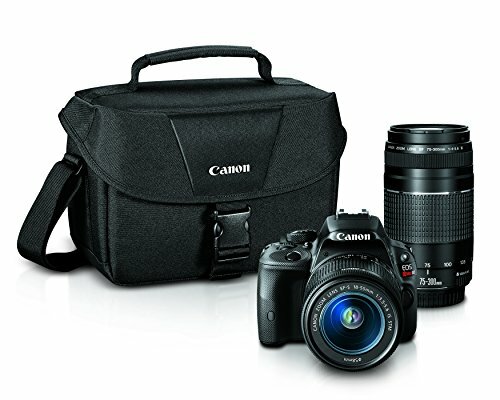 So, we opted for one of the smallest and lightest DSLR cameras on the market: The Canon EOS Rebel SL1. It weighs less than a bottle of water, and the camera body fits neatly into my hand. We’ve been using the same little SL1 for over four years now, and still love it. Sometimes, we talk about upgrading to a professional grade DSLR, but they’re just too bulky, too expensive, and our lightweight SL1 does a fantastic job for us. See prices on Amazon here. My women’s SCOTTeVEST Chloe Glow travel jacket is by far my favorite item of travel clothing. It’s cute, comfortable, and has a whopping 18 hidden pockets to store all my travel gear. Even better, it’s nicely fitted, and is never bulky. See my review here. 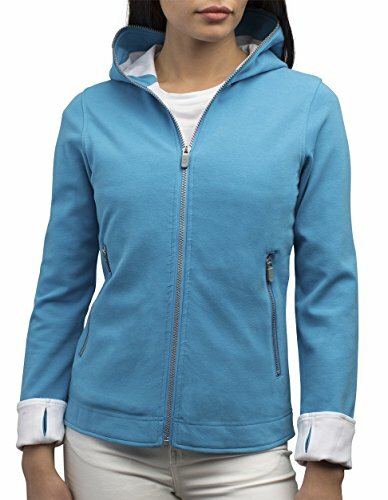 Looking for a men’s jacket? The men’s SCOTTeVEST travel jacket has a whopping 25 pockets and great ratings. See the men’s jacket on Amazon here. Every traveler needs a good travel adapter. 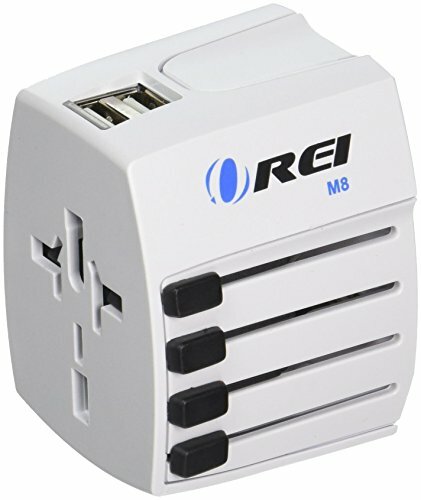 The Orei World Travel Power Plug Adapter is rated one of the best out there, and it even comes with a built in dual USB charger. Tip! A travel adapter connects your plug to the outlet wherever you travel. An adapter does NOT change the power output coming from the outlet so make sure your devices can handle the local voltages. When you’re trying to pack light, quick drying travel underwear is a must. You need something that you can wash out in a sink or bathtub at night, and that will be dry by morning. ExOfficio fits the bill. They’re lightweight, fit comfortably, and dry quickly. We have a couple of pairs coming for review, as we’ve heard from other travel bloggers that ExOfficio underwear is their favorite. Buy women’s ExOfficio travel underwear on Amazon. Buy men’s ExOfficio travel underwear on Amazon. If your budget won’t quite reach to a high end camera or a trip, a Kindle is almost always a great gift for a travel lover. We have the Kindle Paperwhite and love it. The only thing that we wish ours had was the cellular connectivity (it’s about a $70 add on). 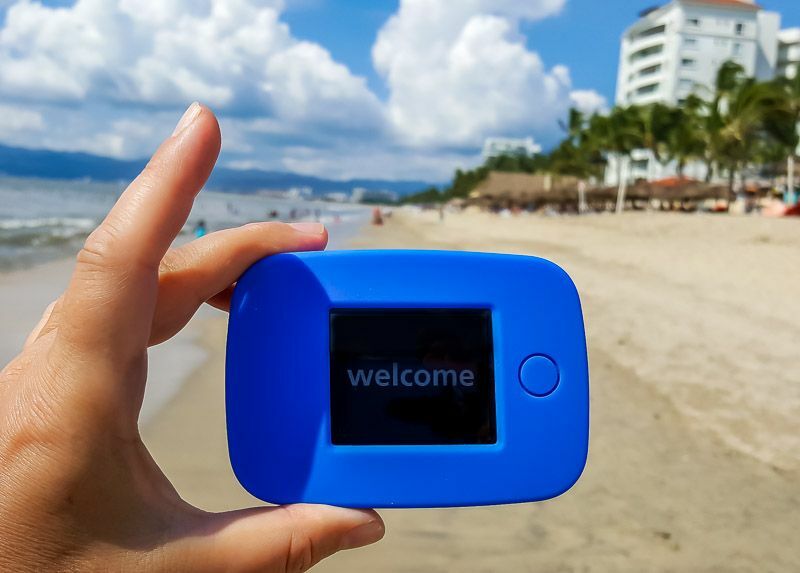 Cellular connectivity is free (after the initial buy), and it will let you download and shop on the go anywhere in the USA or roam in 100+ countries without an additional charge for wireless data. Trust me, your traveler will love this. Buy the Kindle Paperwhite on Amazon. As for books, here are a few of the most popular travel novels out there to get you started. Eat Pray Love. The classic by Elizabeth Gilbert has probably inspired more solo trips than almost any other book. See it on Amazon. Under the Tuscan Sun by Frances Mayes. The book’s protagonist buys an abandoned villa in Italy, and learns to love the simplicity of rural Italian life. The book was made into a movie starring Diane Lane and Sandra Oh. See on Amazon. Wild, by Cheryl Strayed. This is a fantastic book for outdoor lovers. It chronicles her journey along the Pacific Crest Trail when she was 26. See on Amazon. In A Sunburned Country, by Bill Bryson. This is my favorite travel book of all time. It has Bryson’s trademark wit, along with plenty of interesting and entertaining tidbits about Australia. See on Amazon. The Alchemist, by Paulo Coelho. A wonderful, international best seller about Santiago, a shepherd boy who yearns to travel the world. See on Amazon. We also adore audiobooks for travel. Every year we drive thousands of kilometers across Canada and the USA to visit friends and family, sometimes logging in over 40 hours and four thousand kilometers behind the wheel over a week or two. Audiobooks are an absolute lifesaver on those trips. When we start a great audiobook, the hours fly by as we drive across our gorgeous country. It’s a great way to keep the kids entertained, and keep us from going stir crazy. An Audible subscription with Amazon makes a fantastic gift, and you can even sign your travel lover up for a free trial to see if they like it. Check out Audible on Amazon. We’ve moved on from traveling backpack only to wheeled carry on only these days, but for many years we traveled with a backpack. 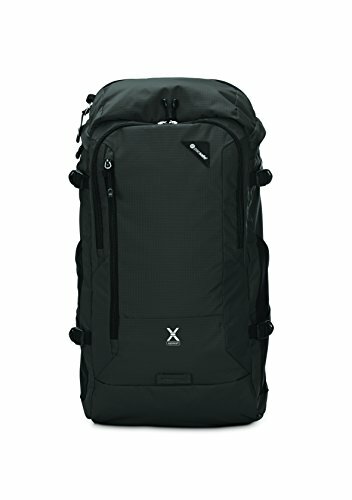 While most people get a backpack based on features and cost, the most important thing is probably making sure you get the right size backpack for your frame. As a woman who’s five foot five, I’ve tried on a few backpacks that are geared for tall men. What a mistake! They’re uncomfortable, the straps dig in, and even worse, the waist straps are often too big. For women, the Osprey Aura 65 AG Backpack consistently gets great ratings, and it’s sized perfectly for female travelers. Even better the Osprey comes in small, medium and large for a perfect fit. See the Osprey Aura 65 AG Backpack on Amazon. For men or taller women, the Deuter Aircontact 65 +10 is a great choice, as is the Osprey Pack Atmos 65 Backpack. 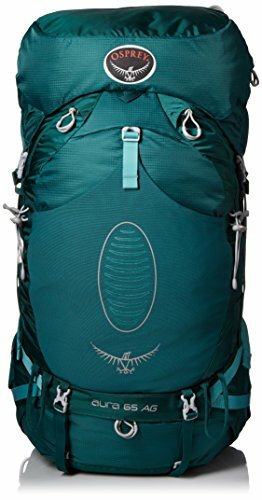 See the Osprey Pack Atmos 65 on Amazon. See the Deuter Aircontact 65 +10 on Amazon. There are a lot of choices for keeping your travel gear safe, from fanny packs to belt wallets to traditional money belts. When we’re in a situation where we need to keep our valuables as close to us as possible, we usually choose a neck travel wallet (see our extensive review of them here). 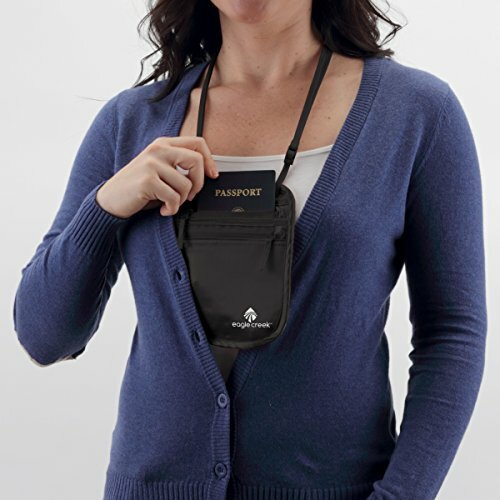 A neck wallet has room for passports, credit cards, money and the like. It’s small enough that you can wear it under your shirt and no one can see it. Tip: The most secure way to wear a neck wallet is like a gun holster; over your neck, with one strap under one arm. If you wear it only around your neck, it’s easy for someone to rip off. The only downside is that it’s a bit embarrassing to have to lift up your shirt to access your wallet if it’s slung under your shoulder. Keep it slung in front of your body. Silk is a good choice for a neck wallet. It feels good against the skin, plus it’s durable, washable and lightweight. I wore the Eagle Creek Silk Undercover Neck Wallet almost every day for a year. It was lightweight, thin, and comfortable, though I did have to sew the straps back on after about nine months. Click to see prices here. If you’re looking for something with RFID protection and that’s water resistant, the Venture 4th Travel Neck Pouch Neck Wallet gets stellar reviews. It’s a great alternative if silk isn’t your thing. Click to see prices on Amazon. For my last few solo trips, I’ve been trying out a top-loading Pacsafe Venturesafe X30 anti-theft adventure backpack. It’s surprisingly lightweight, has a padded tablet sleeve, a wealth of pockets and locking zippers, and anti-theft Slashguard stainless steel wire mesh embedded into it complete with RFID protection. At 18 inches high and 9 inches wide, it’s small enough to use as a personal item with most airlines, and it holds an awful lot. It also has a molded frame that sits on the body quite well. We never leave on a trip without grabbing our external battery chargers. Finding a place to plug in our smartphones, the kids electronics, and our tablets, is a constant hassle, so now we have a few chargers with us at all times. 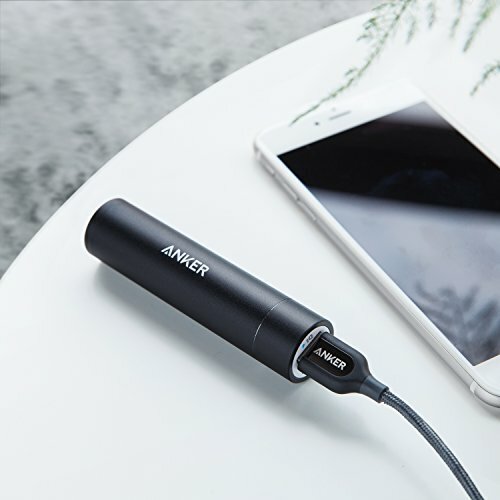 Our little Anker PowerCore+ mini 3350mAh Lipstick-Sized Portable Charger travels with me in my jacket pocket wherever I go. It’s less than 3 oz (80 grams), and less than 4 inches long, so it’s lightweight and compact. I can get a full charge for an iPhone or Samsung S6 from it. Our go-to charger for the family is an older version of the PowerCore+’s bigger sister, the Anker 20100mAh Portable Charger PowerCore. 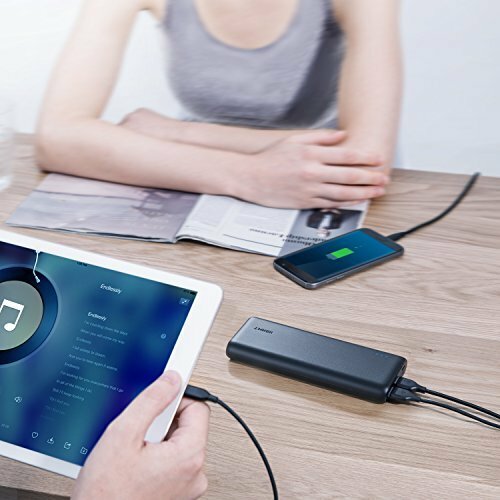 It can charge two devices at once, and has high speed charging. 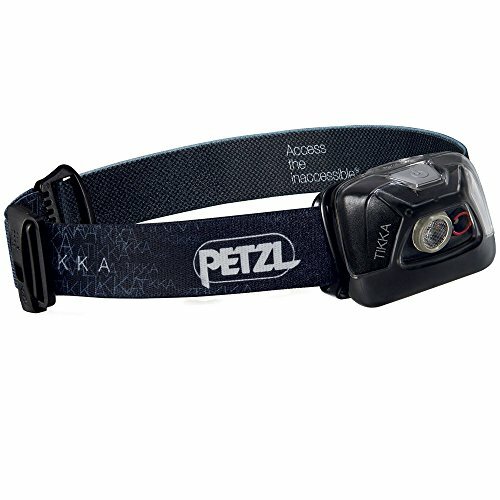 Admittedly, a headlamp isn’t the first thing you’d think of as travel gear, but our Petzl Tikka headlamp has been a must pack item for us for the past 10 years. It’s still going strong after a decade. Even in the age of smartphone flashlights, we still love it because it lets us have a hands free light. It’s perfect for camping, and finding our way around strange cities after dark. We’ve used it for home renovations where we need our hands free, and the kids love to play with it, which is a bonus. The Tikka we use takes three AAA batteries that last us months, and it’s lightweight enough that we carry it with us in our day bag everywhere we go. 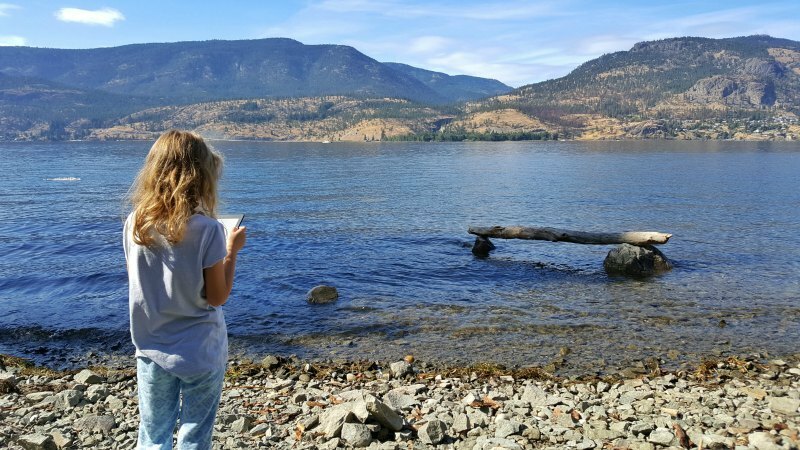 While we spend a lot of time traveling these days, we also spend a fair bit of time at our home base in Canada. We’ve included a few of our favorite at home items here. Even travel lovers like us like to spend a bit of time at home! We’ve been eyeing up a new TV for a while now that does beautiful 4K images. We’re loving the look of the VIZIO M50 SmartCast 4K HDR Home Theater Display, which features Google’s Chromecast built-in and is compatible with Google Home and the Google Assistant. I can’t wait to watch some of our favorite travel TV shows and movies on this beauty! We’ve also been having a blast with our Google Home Mini. It’s powered by Google Assistant, so you can ask it questions, set reminders, control your smart lights, turn on your TV to watch Netflix, and even play some fun games. We’re big Stranger Things fans, so we’ve had a blast using our Google Home Mini to chat with Dustin from Stranger Things 2. Check out this video, where they chat with Dustin on his walkie talkie and head into the Upside Down! What’s your favorite travel gear? Let us know in the comments below! Last year, I was lucky enough to spend a few days at the Marival Residences Luxury Resort in Mexico’s Riviera Nayarit. So, this year, when Marival invited the whole family along to check out their Family Emotion Program we were happy to join in. When you need a break, sometimes an all inclusive hotel is the perfect choice. Winter was creeping in on us in Canada, and the idea of a stress-free vacation somewhere with a long stretch of beach and some nice warm swimming pools sounded like exactly what we needed. Why a special family program? If you’ve ever traveled with kids, you know that it’s a completely different experience than traveling alone or as a couple. Days of lounging on the beach and partying the night away are long gone, and replaced by playtime in the sand and mid-afternoon naps (it’s not all bad). How much does it cost? Click here to find out. The Family Emotion Program at Marival does a really good job of figuring out what parents and kids want. There are plenty of fun activities, a concierge to help organize your trip, and goodies for both the parents and the kids! Marival’s all-inclusive Family Emotion program is just for families. It includes a ton of goodies, all which are customized for your family’s needs. I’m pretty sure they thought of absolutely everything! I think the very best part of the program is that each family gets a family concierge to help with their stay. Our Family Emotion concierge, Raquel, was absolutely wonderful. She was attentive to us (but never intrusive), and always helpful and welcoming. We had absolutely first class service from her – as good as any hotel we’ve ever stayed in. 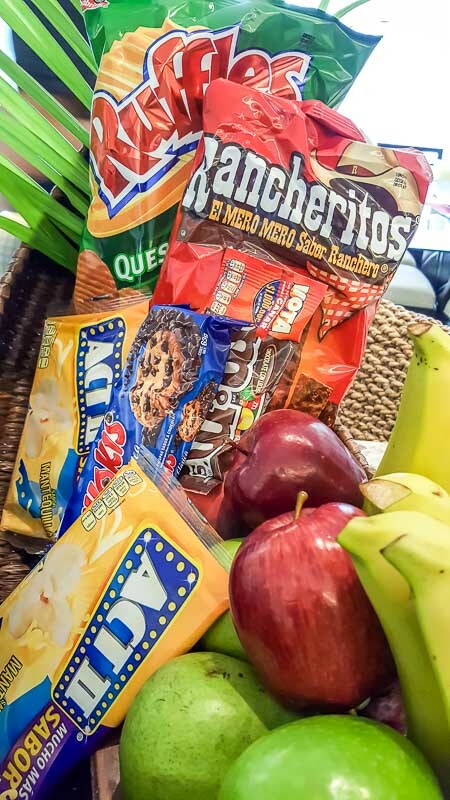 Inside our room, we found a welcome basket of healthy and sweet snacks. With hungry kiddos, this was the perfect welcome! 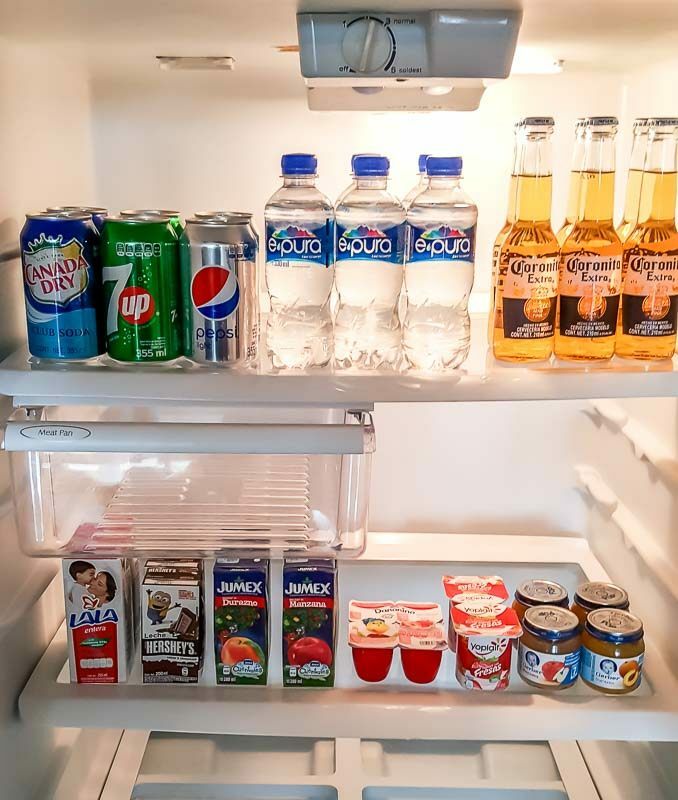 Our full size fridge came stocked with soda, beer, juice, yogurt and chocolate milk! Even better, it was refilled every day and we could request just about anything from the resort. Yes, you heard me right: up to eight hours of child care is included during your stay (conditions apply). That means that if you want to go out together for anything from a special meal to a few hours at the spa you can knowing your children are in good hands. Every day from 9 am to 5 pm, you have the option of dropping your kids off at the kids club. They can play video games, do crafts, and have a lot of fun while you enjoy a few kid free hours. There was an adorable bath basket in the kid’s bathroom, waiting for each child. This included some tub toys and some special child friendly bath products. 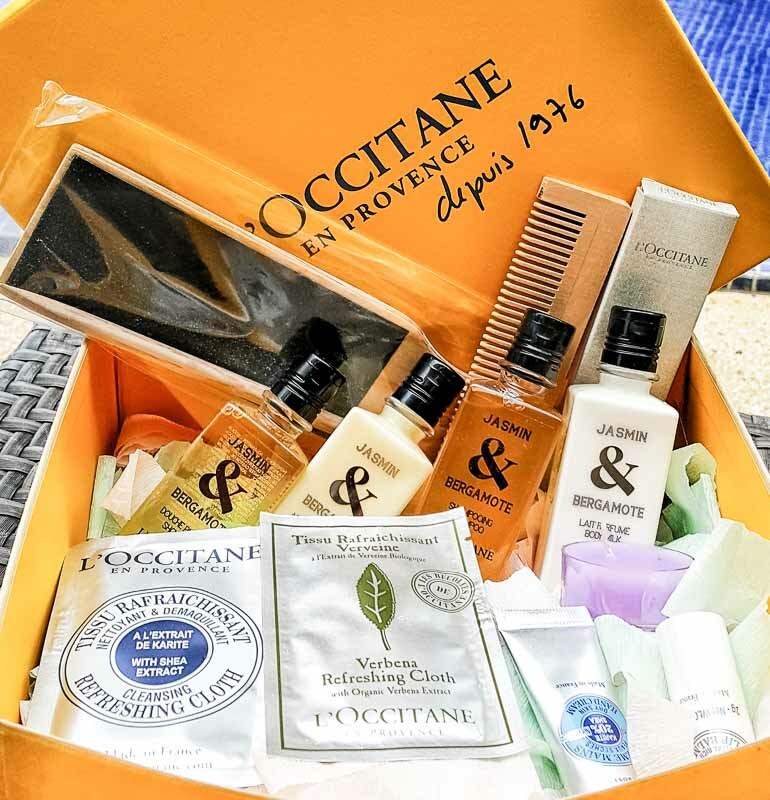 In our suite, we also found a bag filled with sunscreen and beach essentials, plus a family menu to help us select from a broad choice of beach and pool toys, as well as other vacation essentials. Once you’ve selected from the list, pass the form back to the Family Emotion concierge and they’ll deliver everything right to your room. 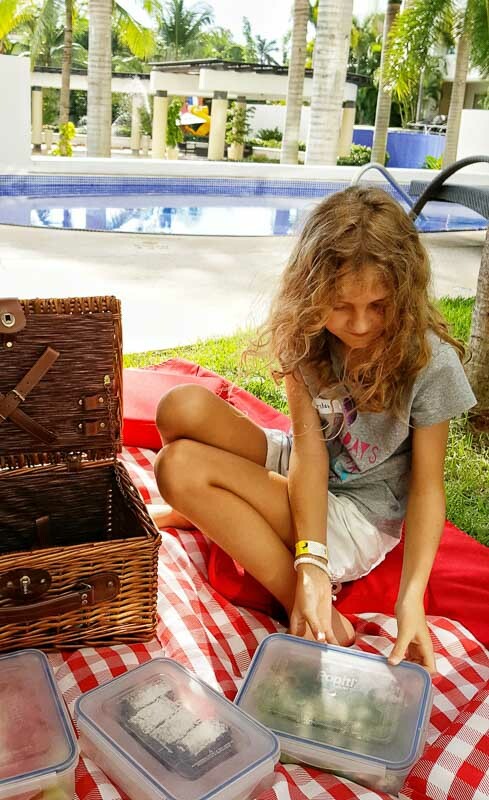 One of the great Family Emotion options at Marival Residences is that you can order a fully prepared picnic for wherever you like. You can have it delivered to the beach or by the pool. We had ours dropped off in our room to enjoy beside our semi private demi pool. The chocolate cake dessert where a huge hit with the kids and we enjoyed the mountain of guacamole they included in our specially made picnic basket. When we ventured out on our own, our kids adored the free Xbox console and game rental they provided. 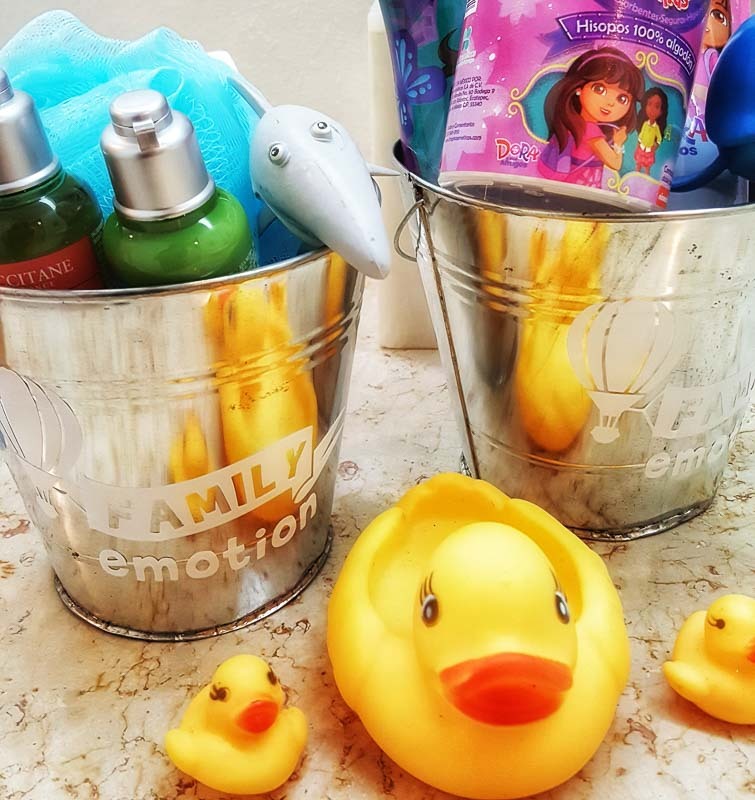 There are also DVD players, movies, electronics, water toys and more available via the Family Emotion program. 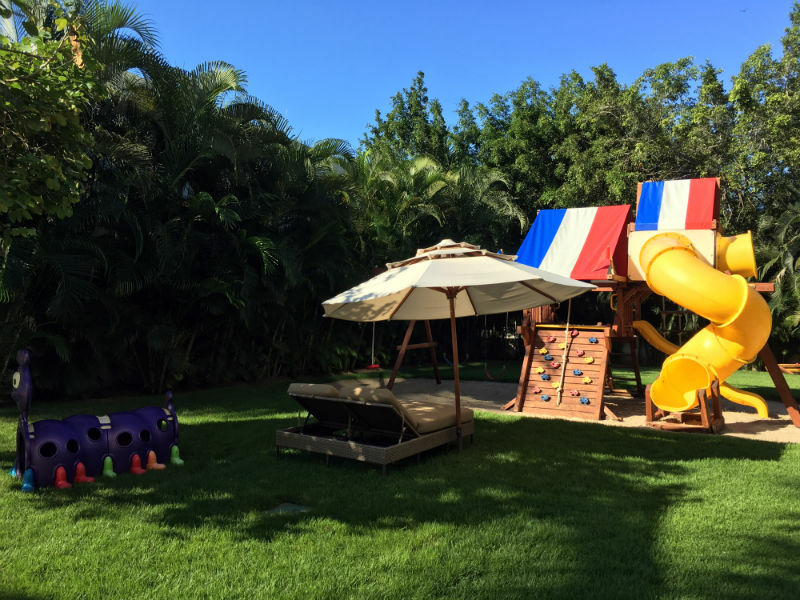 As well as the kid pool and the always entertaining splash pad, Marival Residences also has a playground area and they even rent out free bikes so you and the family can go for a family excursion. The best news, a few of them are 3 seaters so even the littlest riders don’t get left behind. I couldn’t remember the last time that we had a family photo shoot! The Family Emotion Program comes with a professional photo shoot, with a photo album and CD, plus a gift card to develop prints when you’re back home. We were very happy with our family photo session. The sky was a little cloudy however the photos turned out beautifully and the photographer was fun to work with. The Family Emotion package comes with a free off site activity for every person, as well as a free second family tour. 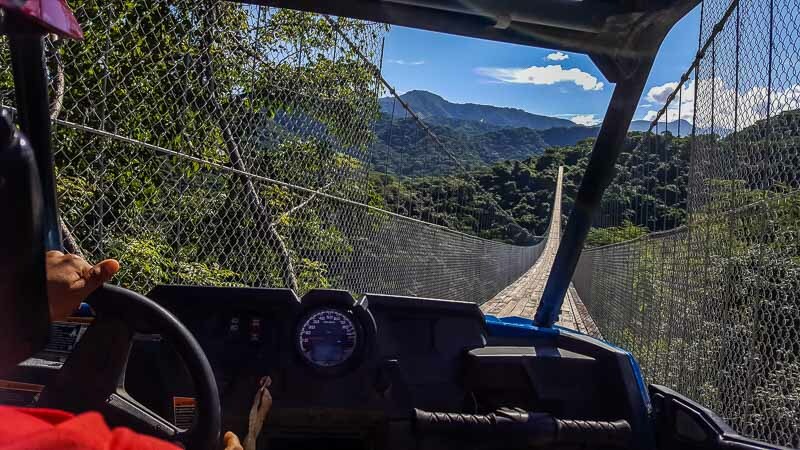 There are numerous options to choose from so went zip lining as a family, and also had a blast driving on a little RAZR off road vehicle over a giant swinging suspension bridge. Want to learn more? 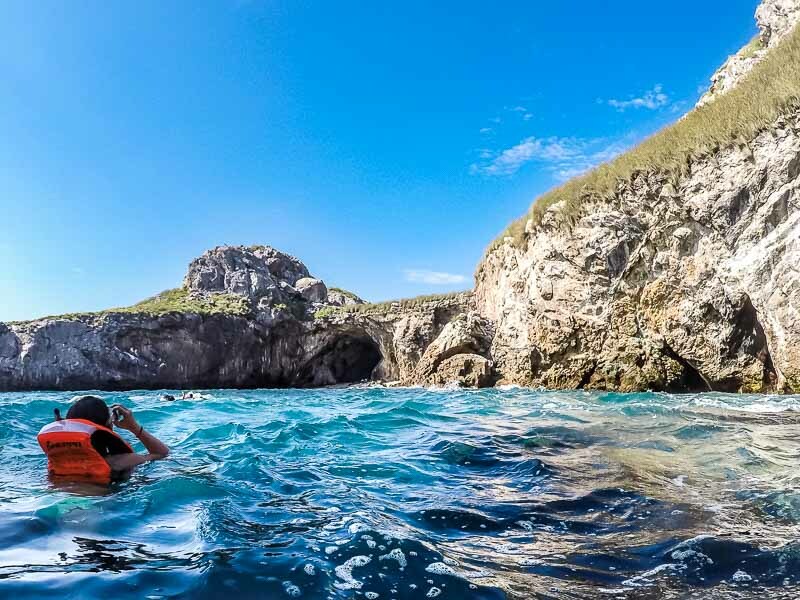 Check out our article on what to do in the Riviera Nayarit, with 23 wonderful experiences, from visiting the bustling surfing town of Sayulita, to checking out the idyllic vibe of San Pancho, to snorkeling the aquamarine waters off Marietas Islands (where you can see birds like blue-footed boobies of Galapagos Islands fame). Our two bedroom Family Emotion suite with a semi private demi-pool was a whopping 1,711 square feet. That’s huge! When we walked into the nicely air conditioned space, we saw a modern open-plan living space with a full kitchen, dining area and a living room with a large flatscreen TV. The two bedrooms each had a private en-suite bathroom, plus each had a flatscreen TV. Our master bedroom had a lovely deep bath and King-size bed, while the kid’s room had two double beds. We even had our own private washer and dryer, plus our ground floor suite had outdoor lounge chairs by the pool as well as a patio table and chairs. The kiddos loved the fridge filled with drinks, and the fruit and snack basket. Anyone with kids knows they get hungry at the most inconvenient times so that was a huge plus when the kiddos were feeling peckish. What about maid service? Yep, it’s included. Our daily cleaning service was always on time, and did a great job. They also provide turn down service complete with tasty little snacks like chocolate or cookies. All of the Family Emotion accommodation is in two or three bedroom suites, with the option of an ocean view, a demi-pool, a penthouse suite, or even a three bedroom private villa. There’s definitely something wonderful about an all-inclusive, no worries vacation. Once we donned our cool, braided bracelets from the Marival Residences Luxury Resort, we could eat and drink all we wanted. Not only could we enjoy all of the facilities at our resort, we also had access to the nearby Marival Resort’s facilities and restaurants. This is a great deal, as you essentially get two resorts facilities for the price of one. 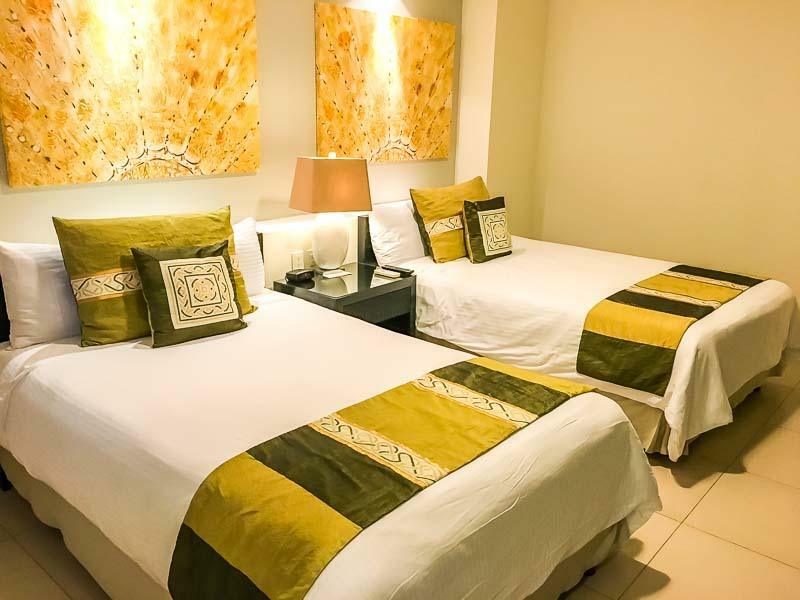 The Marival Resort sister hotel is just five minutes away. There’s a free shuttle that runs every 15 minutes from the main lobby and the Marival Resort also has a special area devoted just to the Marival Residences as well as the rest of the resort. 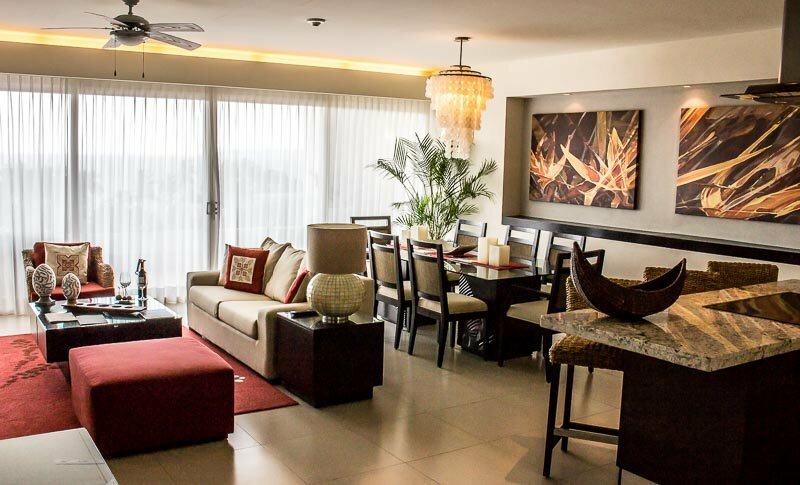 WiFi: There’s WiFi Internet access throughout Marival Residences Luxury Resort. I had great luck with my connection, which rarely dropped, and worked reliably in my room and all throughout the resort. That said, if you find your internet connection to be slow, ask for an upgrade, as they do have faster speeds available. In general, we found the food quality well above what we’ve had at a typical all inclusive in Mexico. 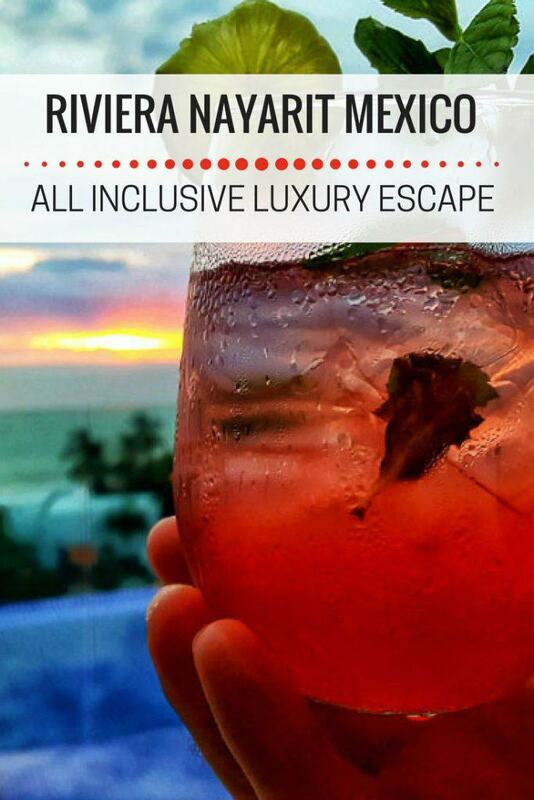 The all inclusive program includes all snacks, breakfast, lunch, drinks and a la carte dinner specialties, plus national and international brand drinks. 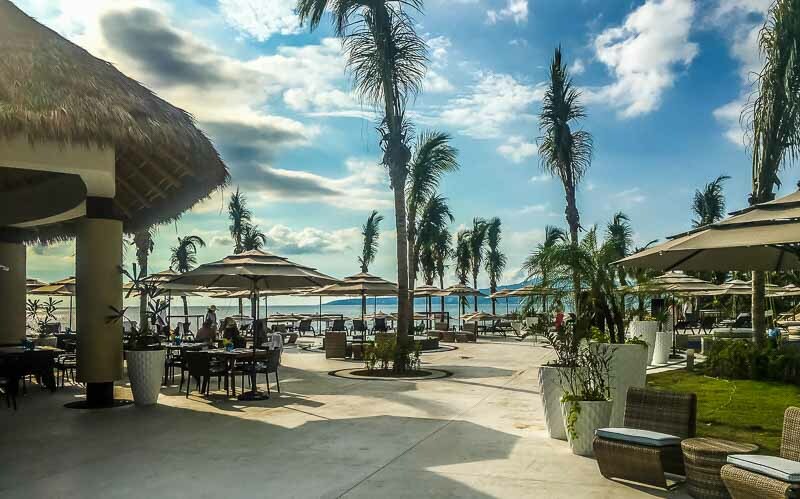 There are five restaurants on site, plus the VIP beach club, room service and poolside service, in addition to six restaurants at the sister resort, Marival Resort & Suites. As vegetarians, the kids and I were very happy. There were always vegetarian options available, which is wonderful, because we often have a difficult time at resorts! There’s really not much bad to say about the food here, but we’d love to see a few more family friendly menu items always available at the hotel, like pasta or pizza. Since the menu for the Lemmon Grass was a set menu, there wasn’t a lot for kids there. When we went inside to Omaggio, the theme night was Asian, and like many US and Canadian kids, ours don’t love Asian foods. When we went upstairs to Insu, we found a few items that the kids loved, but it would be nice if the main restaurant, Omaggio, always had a few kids’ items available, or a separate kids menu. 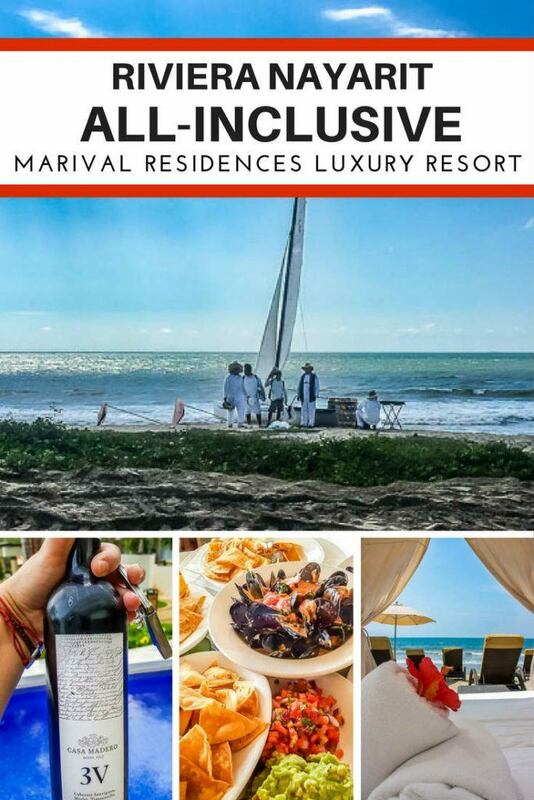 Room service is included with the all-inclusive package at Marival, though you do pay a 10% surcharge. 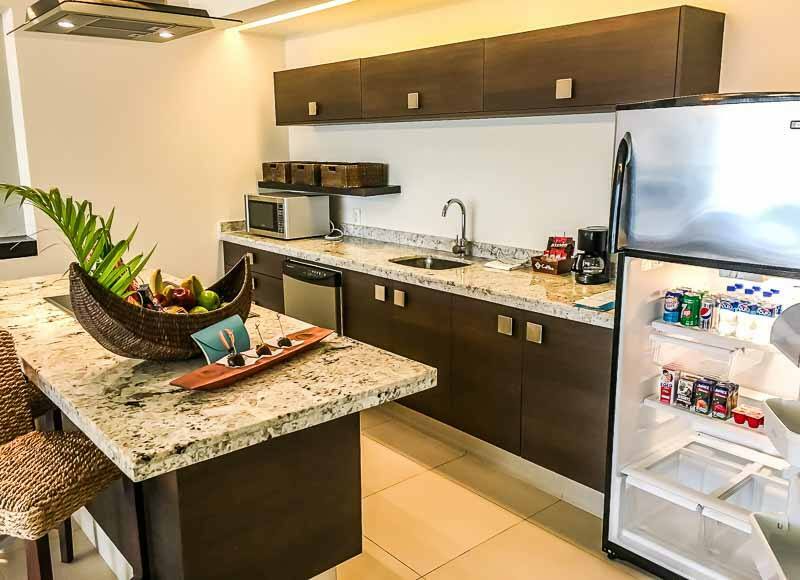 Being able to get room service 24 hours a day, seven days a week was one of my favorite parts of staying at the Marival Residences. The kids loved it too! We had great luck with room service, as it came quickly and everything was the correct temperature and quite tasty. Our room was close to the main lobby, so that may have made it especially fast. Their breakfasts were especially tasty. Insu was my favorite restaurant at Marival Residences Luxury Resort. It’s located in the penthouse of the main building, above the lobby, with an impressive view overlooking the Pacific Ocean. Menu items are all bite size to share, and we all found everything to be delicious. 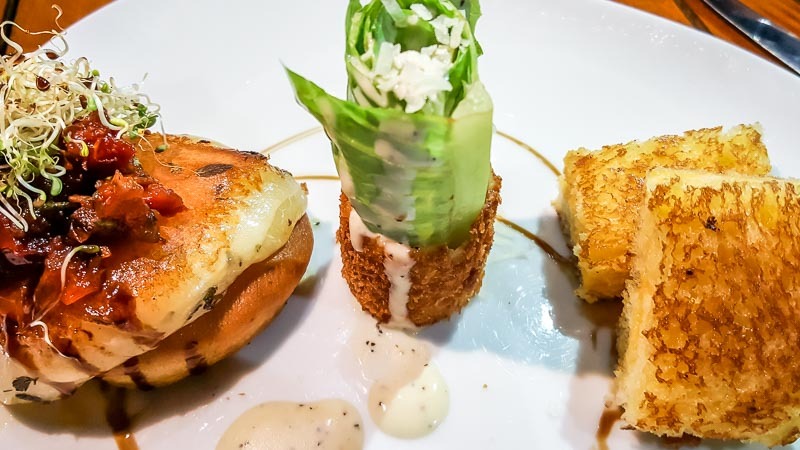 My kids adored the bite sized Caesar salad and especially the grilled cheese while Charles raved about their great sliders. The largest restaurant at Marival Residences is Omaggio. The menu is huge, with a great selection, and it offers a themed evening menu for each day of the week. 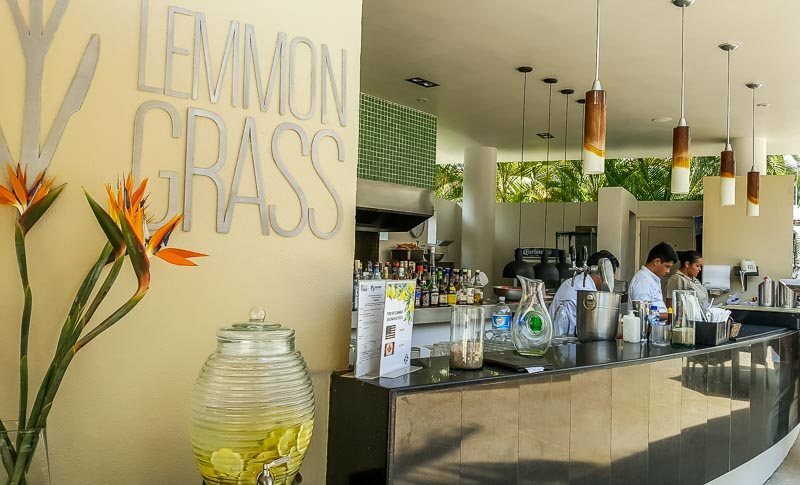 Located outdoors, Lemmon Grass is a casual and elegant poolside restaurant. It has a set menu at night however the menu varies by day. 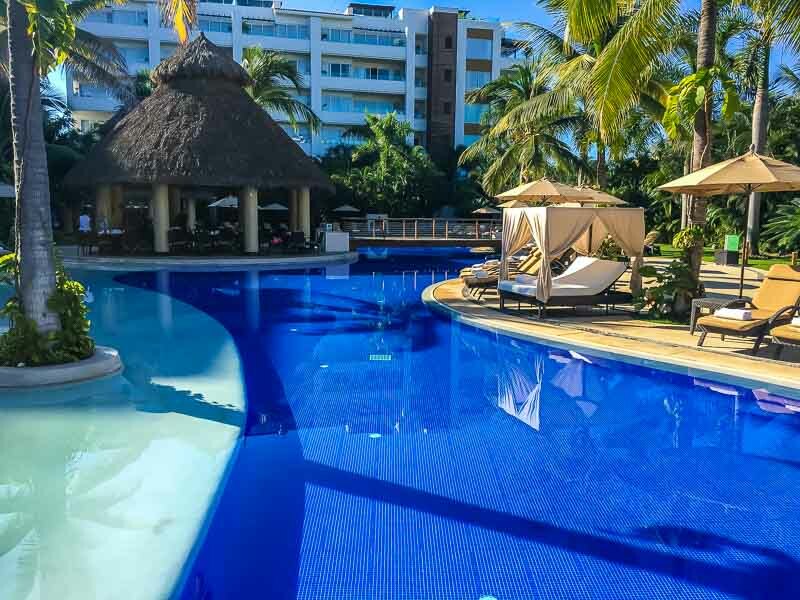 Grill al Fresco is outside by the pool, and has plenty of dishes for breakfast, including Mexican delights, an omelette station, and a selection of fruits, juice and pastries. At night the Grill al Fresco transforms into a barbecue. Brunello Lobby Wine Bar is a lovely, intimate spot to enjoy tapas and a glass of wine (some wines are not included in the all-inclusive plan). If you’re in the mood for a snack by the pool, just wave over a server, and they’ll bring you snacks and drinks poolside. Our family can wholeheartedly recommend the chips and dip as well as the fries. The guacamole everywhere in the hotel is extraordinary! 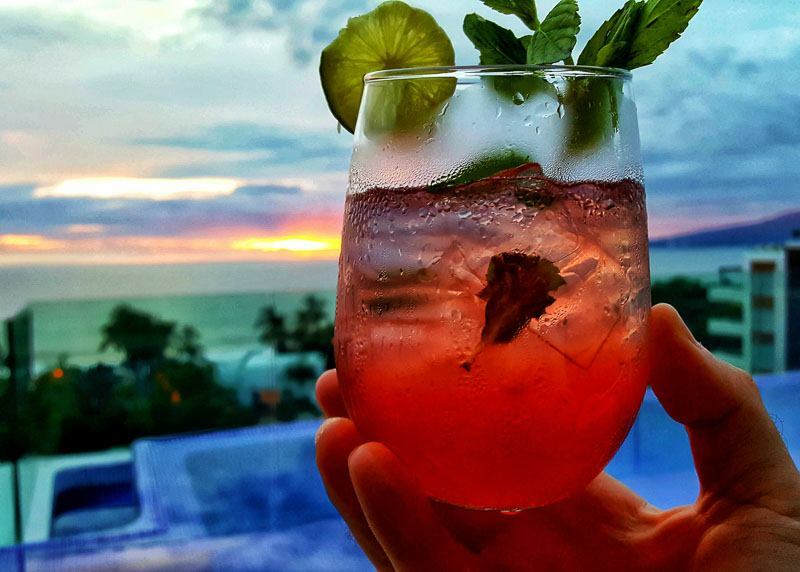 The brand new, ocean side Mozzamare Beach Club serves up (my favorite!) tasty guacamole and chips, fresh seafood as well as gourmet dishes and beverages. They were still partly under construction when we were there however the area was already looking gorgeous and, judging by all the smiling people, a huge hit with the crowds. There’s beach access, a Palapa Restaurant and another gorgeous pool here, and this beach section is only a few minutes walk from the main area, conveniently on site at the Marival Residences Luxury Resort. Charles and Cole both grabbed a free boogie board and enjoyed the waves while we all enjoyed watching dolphins jumping out of the water in front of us. The Mozzamare beach club is new this year, and it’s a fantastic addition from my trip last year. We also enjoyed a special night time celebration at the Mozzamare Restaurant and think that it would be the perfect location for an outdoor wedding! Guests of the Marival Luxury Residences can also eat at the sister hotel, the Marival Resort. The Marival Resort has several restaurants, including La Pergola (the large buffet restaurant), Piazzetta del Forni (thin crust pizza), Las Palmas (Mexican cuisine), La Palapa and Miramar Bars, La Bamba Rodizio, and Amalfi (Italian). If you’re a spa lover, then the onsite Melange World Spa is for you. The spa treatments and decorations are based on therapies from around the world so if you love choices, then this is the spa for you! At Melange, you can enjoy a specialized World Spa Experience from Mexico, Italy, Japan, Turkey, Russia, Bali, India, Thailand, or the USA. Each spa is unique, and based on the spa history and culture for which it’s named. We had a wonderful time with the family spa package. Both of our kiddos (aged eight and twelve), enjoyed a facial and massage with us. I think that our daughter may have found one of her new favorite things to do on vacation. 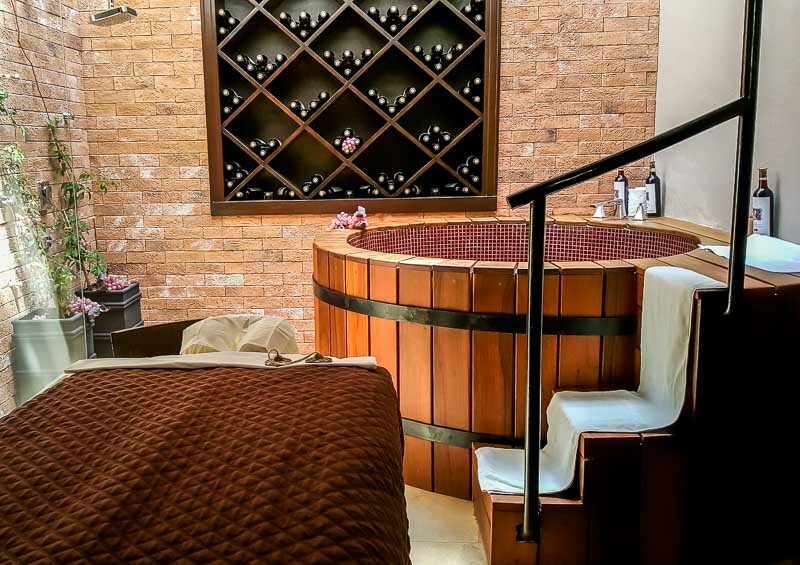 The Italy Vendimia Wine Experience starts with a wine therapy bath in an original wooden winebarrel, where you enjoy a wine tasting, followed by a full body relaxing massage. The India Shirodhara Spa Experience includes a Shirodhara treatment with herbal oil that is poured in a steady stream onto your third eye, and a gentle scalp massage to help relax the nervous system. All of this is done on a traditional wooden table (with padding to make it comfortable) that was imported from India. 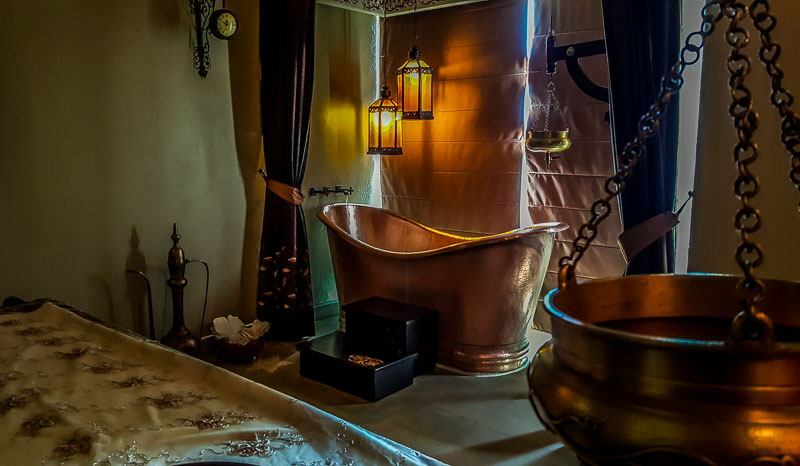 Following the oil treatment, there’s an Abhyanga therapy whole body massage with warm herbal oils, followed by a steaming hot water bath in a luxurious copper tub. 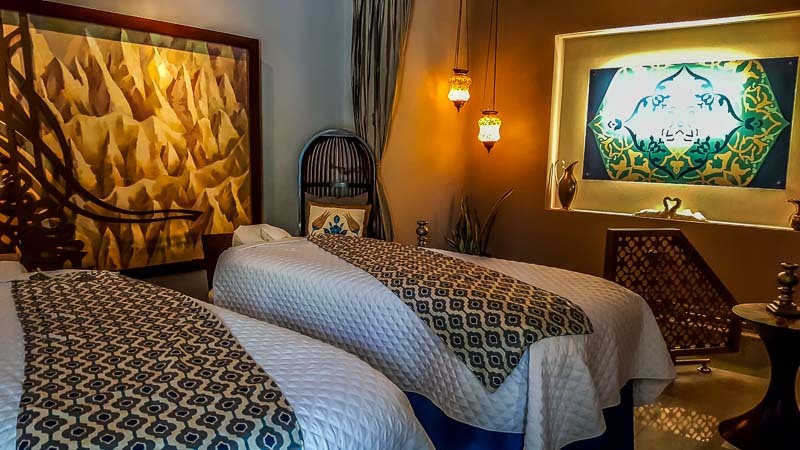 All of the spa treatments are uniquely customized to the area of the world where they originated. 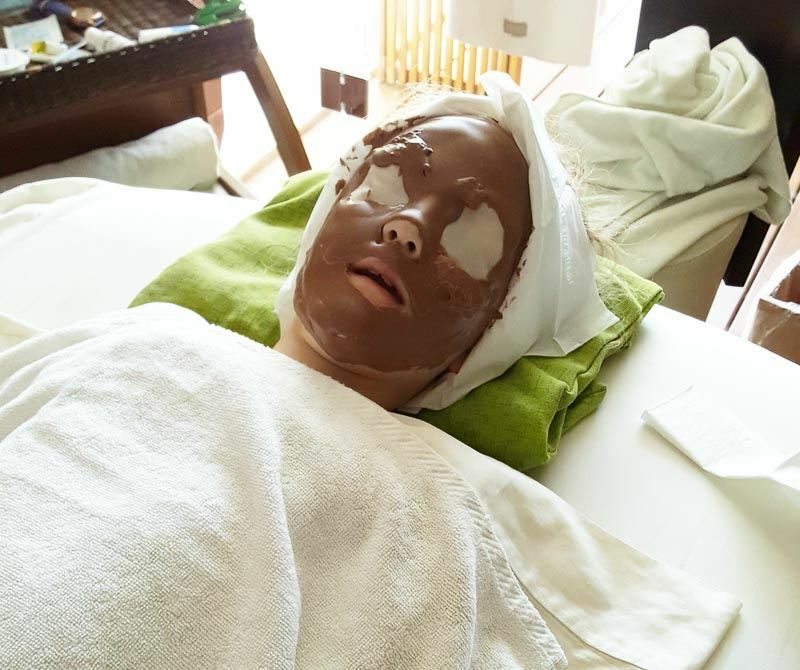 For instance, the Mexico Agave treatment (which I enjoyed last time) featured a facial and body wrap with the native agave plant, cacao, honey, aloe vera, and Mayan mud, with a facial and body exfoliation and a light body massage. There’s also a specialized couples massage, or a men’s wellness & renewal treatment. Melange also offers traditional spa treatments, including facials as well as hand and foot treatments. 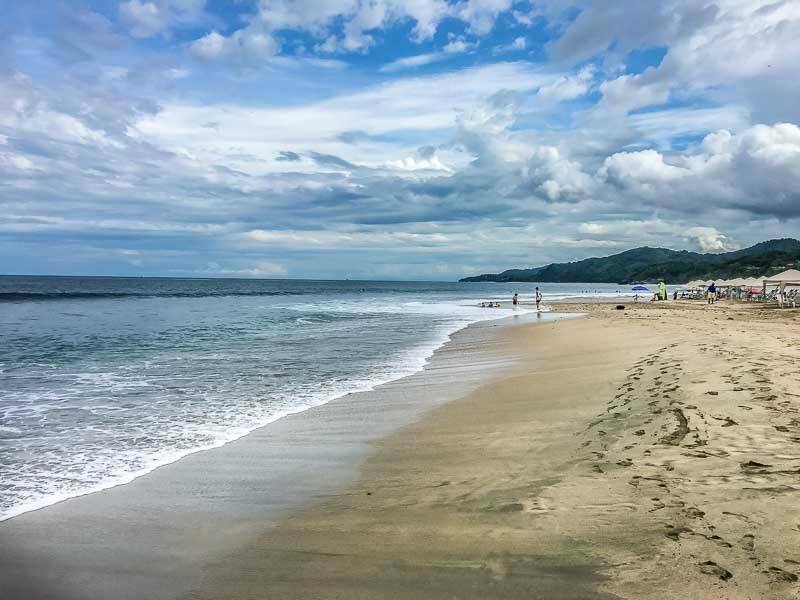 The Riviera Nayarit, which includes Nuevo Vallarta, is the northern neighbor of well-known Puerto Vallarta, on Mexico’s ruggedly beautiful Pacific Coast. 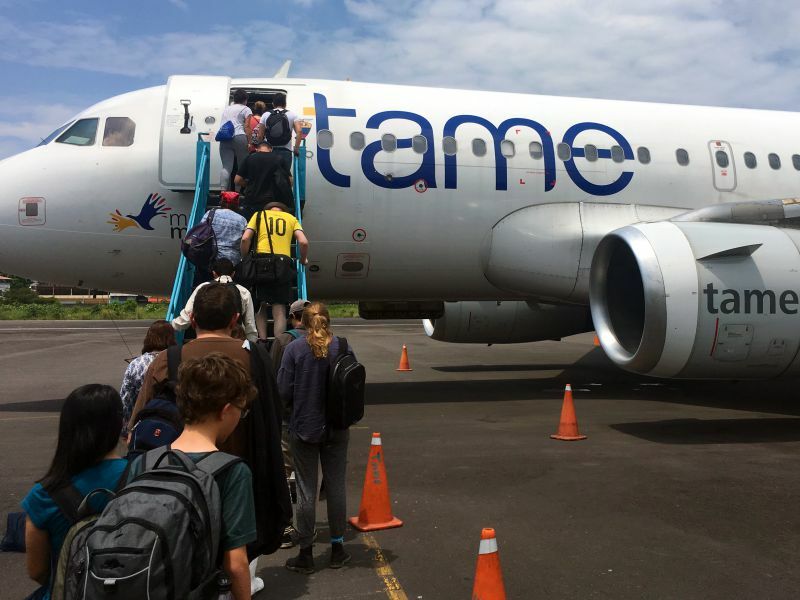 The Puerto Vallarta airport actually serves both areas and is actually closer to Marival Residences (around 15 minutes) in Nayarit than some of the downtown hotels on the Jalisco state side. Like many Canadians, we’ve been to many all-inclusive resorts, and we’ve visited Mexico many times over the years. 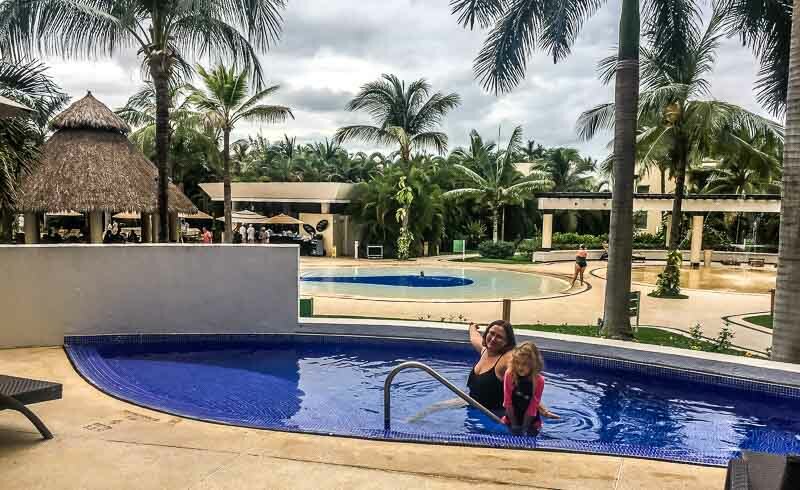 The Family Emotion Program at the Marival Residences Luxury Resort was, hands down, one of the very best family programs we’ve ever enjoyed. It’s a perfect place to visit for a stress-free, relaxing holiday with the kids! Want to book? Just head over to the Marival website to book directly with the hotel. We even have a great deal for you with the Marival 100 Free Extra Ahhs promotion. You can get a $100 Spa Credit to relax and celebrate the brand new Marival Residences Beach World! There’s a 5 night minimum stay. Where to book? You can book directly with the hotel. 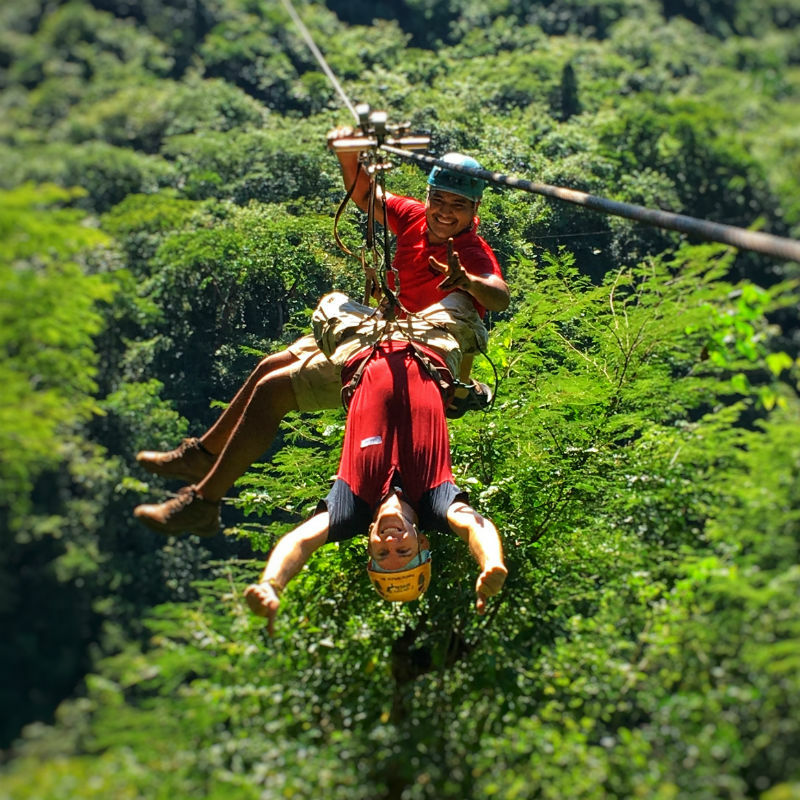 This trip was in partnership with Marival Residences Luxury Resort and the Riviera Nayarit tourism board. It’s no secret that we love Isla Mujeres on Mexico’s Gulf Coast. 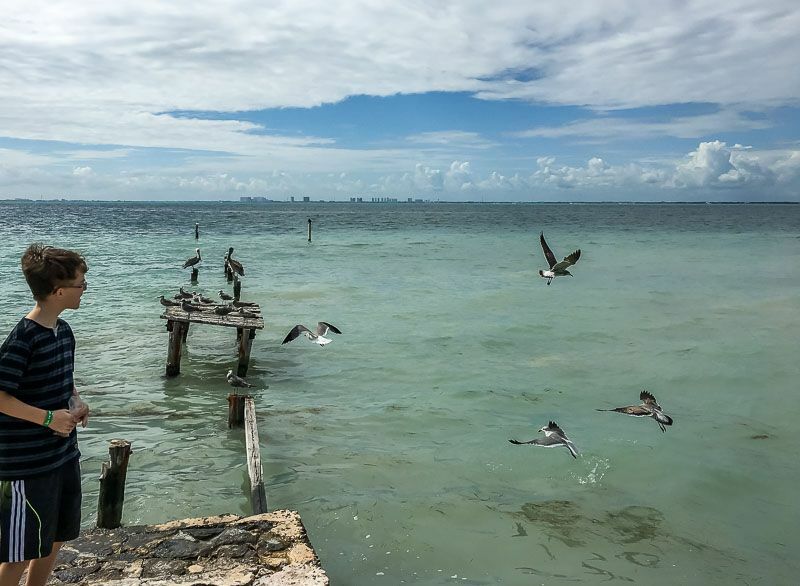 Warm blue waters, fantastic beaches, good snorkeling, and a great selection of restaurants all make Isla Mujeres a must see if you’re on Mexico’s Mayan Riviera. 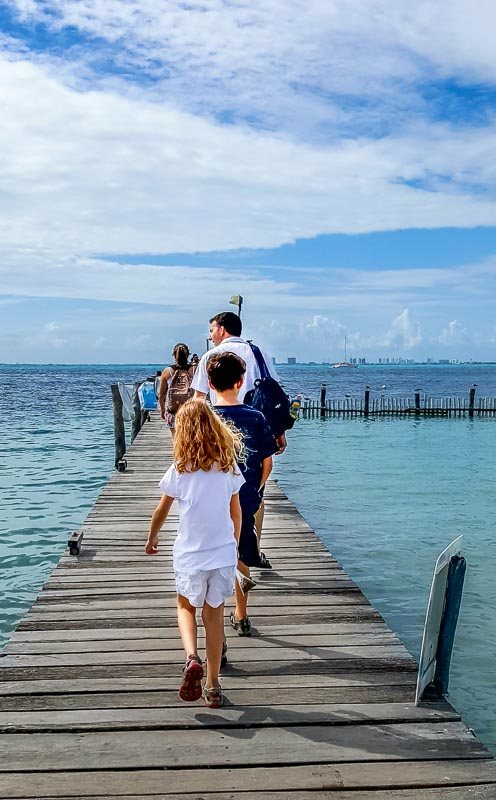 Located only a short 20 minute ferry ride from Cancun, Isla Mujeres makes a great day trip and an even greater longer mini escape from your Cancun vacation. Oh yeah, have I mentioned you can drive the entire island on a golf cart, in half a day? We did it the first time a few years ago and it’s still one of our favorite family travel highlights. 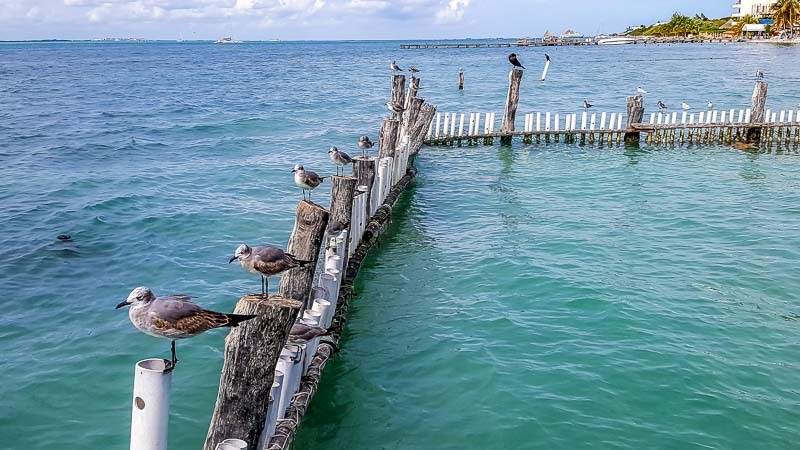 Likewise, if you find yourself down in Playa Del Carmen, Akumal, Tulum or even staying on Cozumel, then Isla Mujeres is pretty easy and inexpensive to get to. We’ve done the trip from Playa del Carmen more than a few times now and have enjoyed our trip to Isla Mujeres every single time. Now, we’ve written about Mexico‘s Isla Mujeres a few times over the years and, to be honest, not much has changed. Of course it’s grown, but that only means more golf cart rentals and more options. We don’t find that it’s gotten any busier and it seems there’s just more to do there these days with a lot more places to rent from. 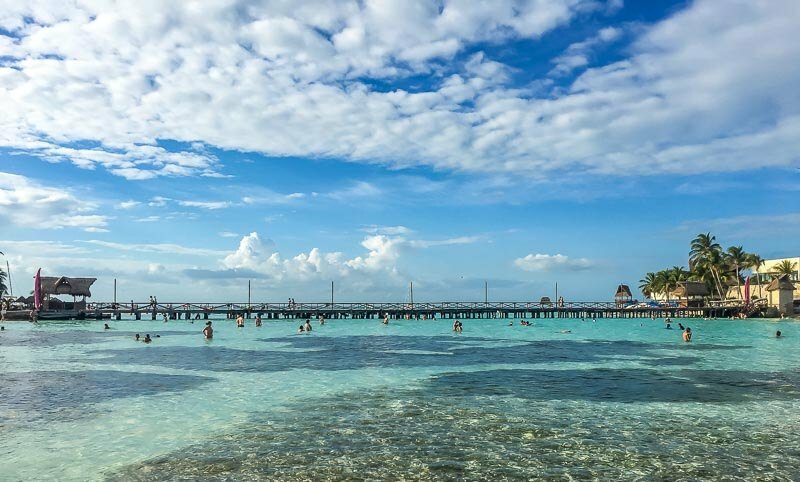 So, without any further ado, here are our things to do in Isla Mujeres. 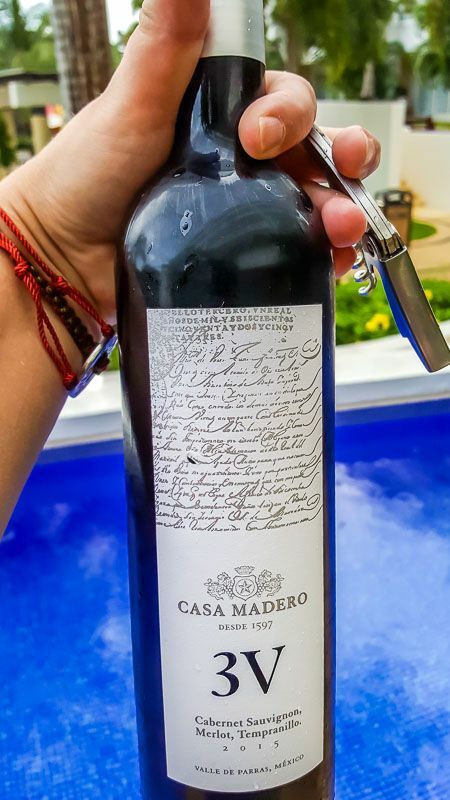 Haha, if you read our previous Isla Mujeres post you don’t think I’d miss this one. There are now dozens of golf cart rental companies on Isla Mujeres, and though they do still occasionally run out during the holidays and busiest times of the year, most days you’re fine as long as you arrive before noon. You can pretty much drive to every place on the island, and if you’re there for multiple days, you can spend lazy afternoons on different beaches every day. You can walk or take a taxi most places on the island, but if you want true freedom, rent a golf cart and enjoy yourself. Since we just talked about beaches, there are around six semi-official major beaches on Isla Mujeres and a bunch of smaller ones. Some, like Playa Norte, feature bars and beach chairs and on many you can rent SUPs, kayaks, water toys and even snorkeling equipment. Playa Norte (North Beach) is by far the most popular and is often rated one of the best in the Caribbean. Playa Norte is just minutes from downtown, and the palm trees and luxurious white sand make Playa Norte muy hermosa. Playa Norte has almost no current, and kids and adults can wade pretty far out and the water will only reach their waist. Playa Posada, found along the west side isn’t as crowded, however the water isn’t as clear, and Playa Media Luna is a beautiful crescent shaped beach but the water can be rough. Playa Indios, Playa Paraiso and Playa Lancheros are all more secluded beaches found on the west side facing Cancun. You can rent beach chairs and umbrellas there, and open air restaurants, gift shops and public bathrooms are close by. There are lots of hotels to choose from on Isla Mujeres, and they cater to every taste and budget. 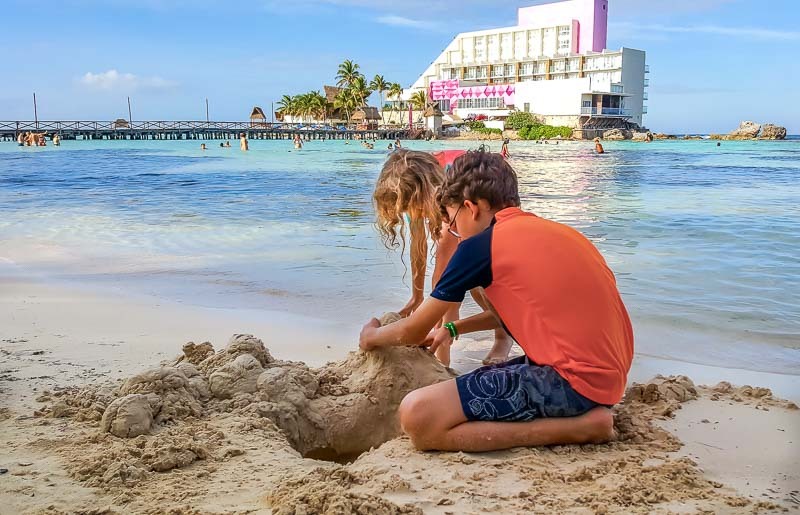 You can stay on the beach or off, with a family or as a couple, at places like Beloved Hotels, an Adults-Only Boutique All-Inclusive. 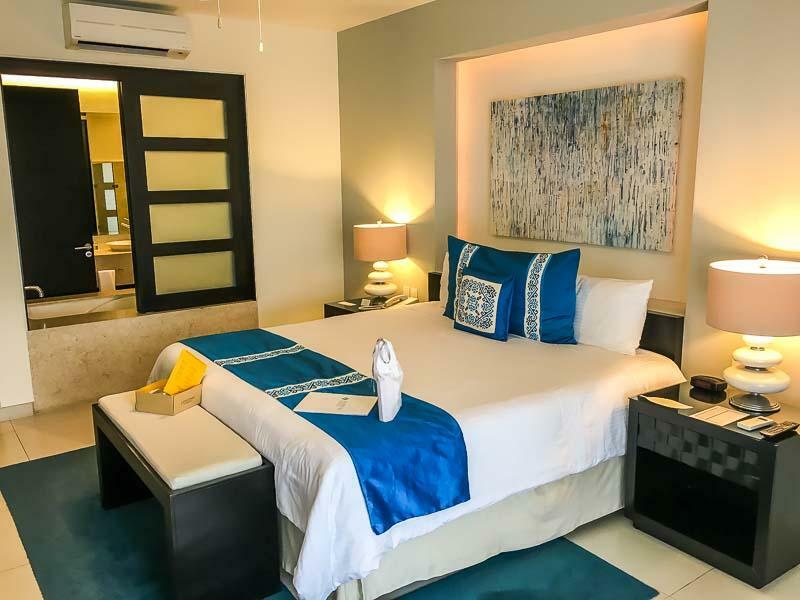 With swimming pools and all inclusive plans, staying at a hotel in Isla Mujeres can be a great way to start or end a long day seeing the sites. Love sea turtles? 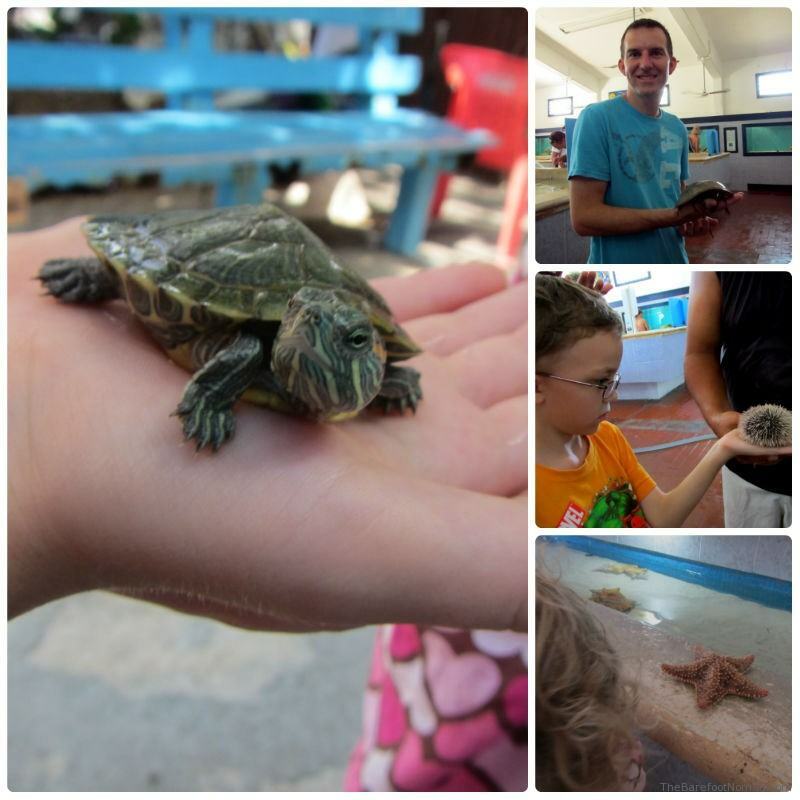 So do we, and that’s why we always stop by the Turtle Farm in Isla Mujeres. 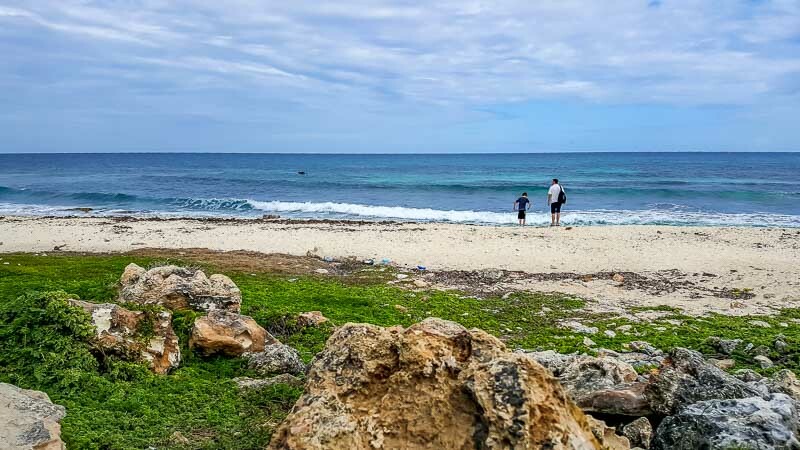 Since large sea turtles have made Isla Mujeres their breeding ground for generations, the Turtle Farm gathers up the eggs it finds along the beaches and incubates them at the Turtle Farm thereby greatly increasing their chances of survival. 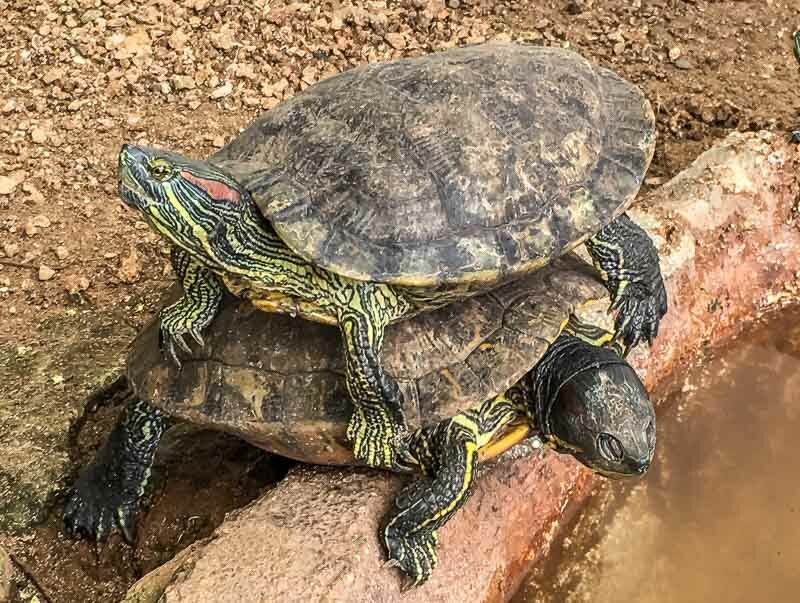 Depending on the time of year you’re there, you can see hundreds of turtles in the tanks growing up in the large tanks around the property. There is a great celebration the day they’re released back into the wild. In the main building there is also a small aquarium with sea horses, lobsters, crabs, tropical fish and even an octopus. There are also a few land turtles and family of iguanas who hang out along one side of the building. 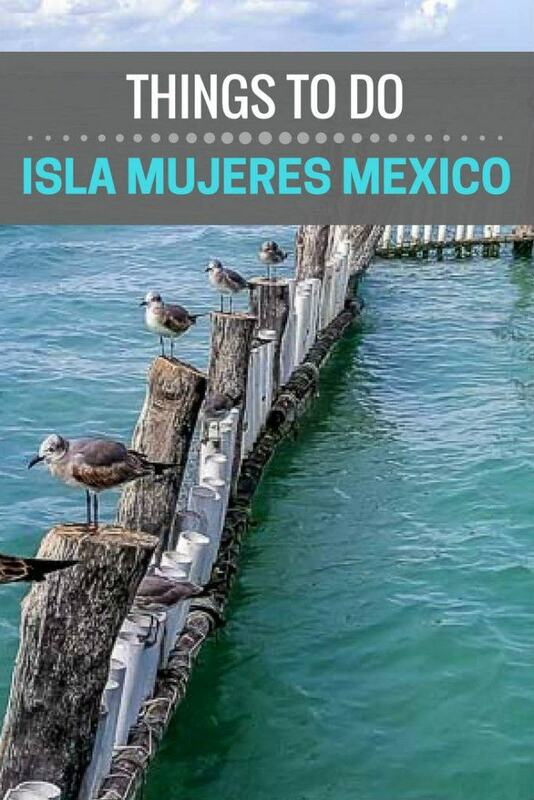 If you’re looking for quirky things to do in Isla Mujeres, you can check out the Floating Bottle Island. Created a few years back by Richart Sowa, this floating recycler’s dream is completely built using used plastic water bottles and recycled materials, including a three story house and an outdoor bar. You’ll need to talk to the locals about its current location, since the floating house moves around the island from time to time. There is a small entrance fee. 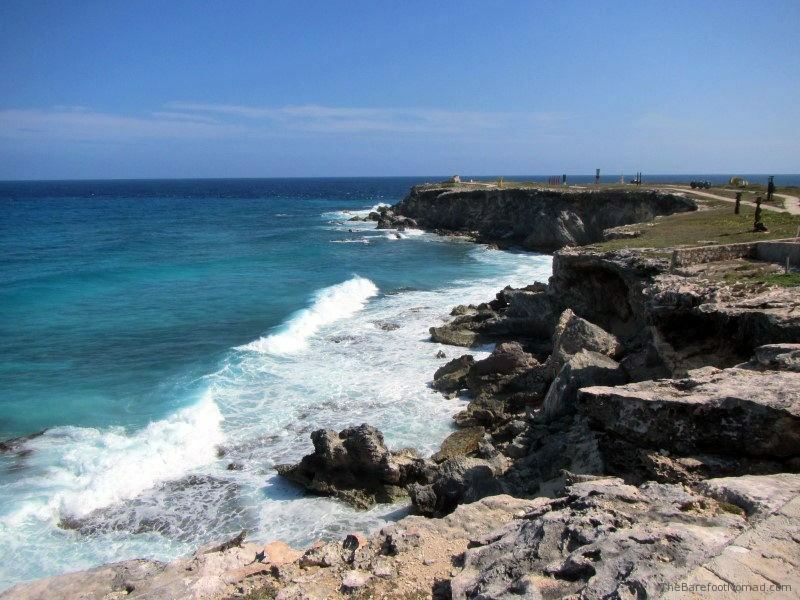 Located at the far southern edge of Isla Mujeres, Punta Sur features not only the highest elevation in all the Yucatan, but it’s also the easternmost point in all of Mexico. That’s right, the sun hits Punta Sur before anywhere else in Mexico and we’ve heard that it’s a glorious sight. Featuring an ancient Mayan temple honoring the Mayan Goddess Ixchel, it also boasts a lighthouse and dozens of modern sculptures around the property. 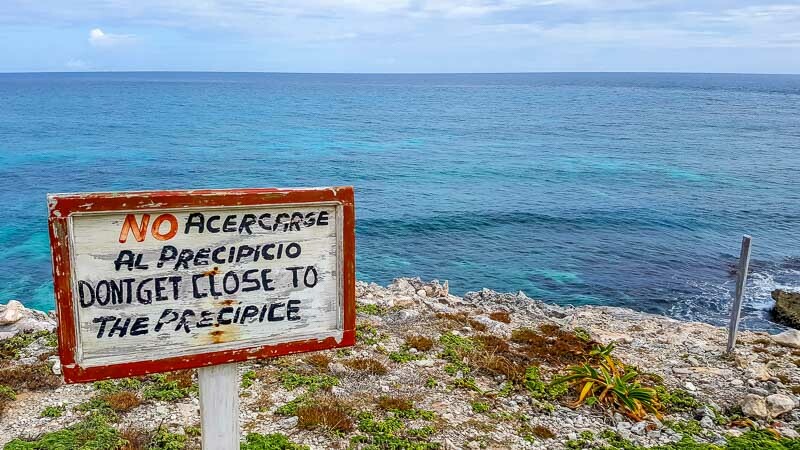 Due to some of the most dramatic sea cliffs in all of Mexico, Punta Sur makes a great place to grab a bite to eat while looking out to sea. Conceived by Jason deCaires Taylor, Isla Mujeres is home to the largest underwater museum on earth. The clear waters off Isla Mujeres make a great place to scuba dive or snorkel while seeing how thousands of underwater sculptures change in time in regards to coral growth and marine interaction. The scope of the project is mind blowing and the combination of art and marine conservation is great to see. The Garrafon Reef Park is a great place to spend an afternoon. Its all-inclusive packages include a buffet lunch and an open bar. Not only do they feature zip lines over the clear aquamarine waters, you can rent kayaks, snorkel equipment, life jackets and they have plenty of hammocks to lounge on as well as relax in their infinity pool. 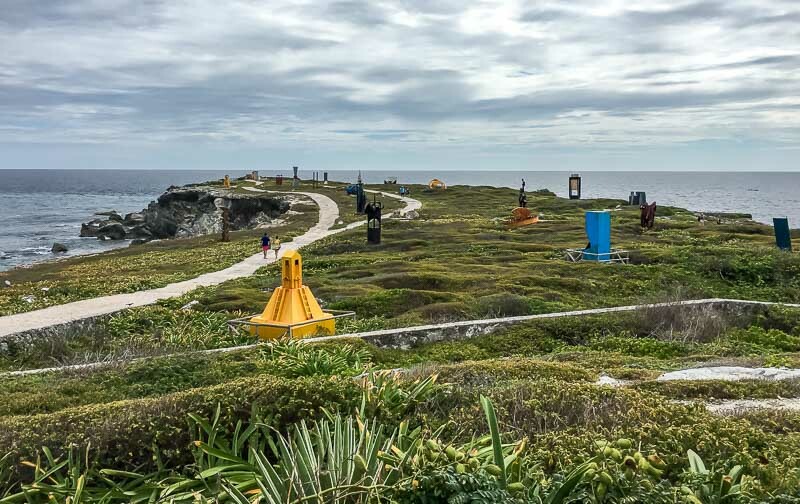 Admission includes bathrooms, lockers, showers and entrance to the Sculpture Garden and Punta Sur. The Garrafón de Castilla is right next to the Garrafón Reef Park at the south end of the island, and your entrance fee includes lounge chairs with beach umbrellas, restrooms and shower areas. You can rent snorkel gear and lockers here. They have a small snack bar and a restaurant right on the property. Located in the center of town, the Zocalo or Town Square comes alive most evenings as celebrations, dances and events kick up with local Mexican families and tourists alike sharing in the celebrations. You can eat tacos and pastries from the vendors lining the park, as well as pick up souvenirs from local artists. The kids will enjoy the small playground. We’ve talked about the beaches, but there is also world class deep sea fishing in the water of Isla Mujeres. From deep sea fishing for marlin, sailfish and dorado to spear fishing tuna and barracuda, Isla Mujeres has some of the best sea fishing in the Mexico. Tours and guides can be hired for the day or the week. Look closely! You can see Cancun on the horizon. Being surrounded by water means some of the fun things to do in Isla Mujeres occur under the water. You can snorkel and scuba dive all around the island and there are dozens of companies that will take you out on a scuba or snorkel tour to see many types of corral and colorful tropical fish including sailfish from December to June. From June to September you can swim with giant Whale Sharks and anytime of the year is great to swim in the National Park that’s filled with the MUSA Underwater Sculpture Museum’s sculptures. Most tours include lunch buffets as well as snorkel gear. 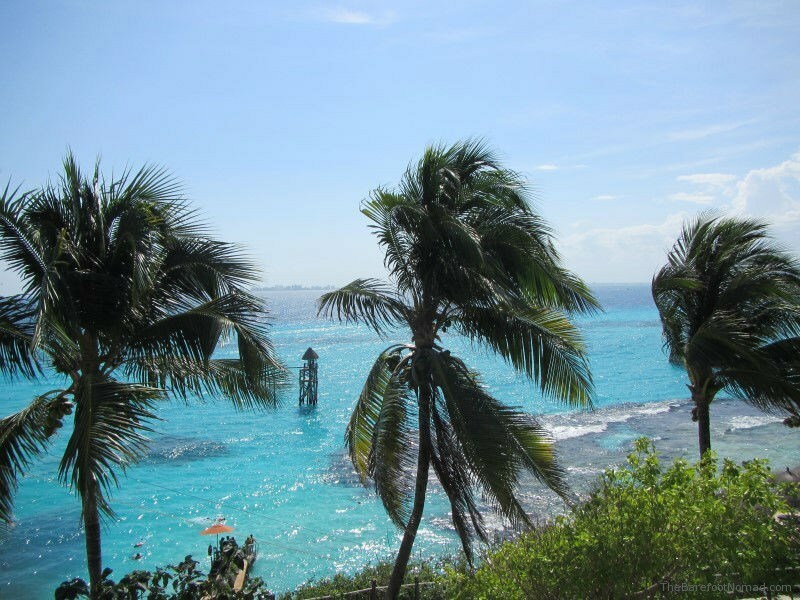 Have you been to Isla Mujeres? Do you have any tips? Let us know! This post is brought to you by the Canadian Air Transport Security Authority (CATSA). If you think Santa’s list is long, you should check out the Canadian Air Transport Security Authority’s (CATSA) What Can I Bring list. It’s basically a naughty-or-nice list for aviation security. The What I Can Bring list is a searchable database saying what can and cannot pass through airport security in your carry-on or checked luggage. It has hundreds of items, so here’s a seasonal selection of what’s good to go and what’s a no-no this holiday season. Here’s what not to bring on the plane this holiday season. This shouldn’t be too surprising, but if you’re helping Santa to bring toy guns, replica knives or anything similar this holiday season, you’ll have to mail it to your destination or pack it in your checked baggage. 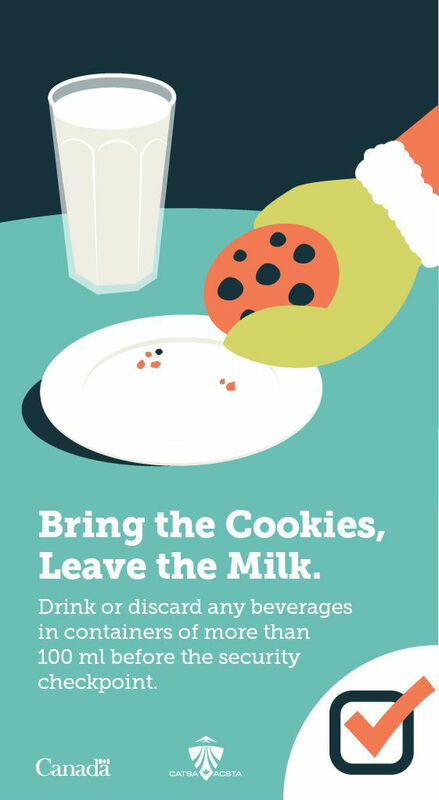 Pack your egg nog in your checked bag if the container is larger than 100 ml. Passengers are allowed to bring only as many smaller containers as can fit inside a 1L bag (which is available at the checkpoint). Check CATSA’s website for more info. Leave your gifts unwrapped when bringing them through the security checkpoint, in case their contents need to be inspected. 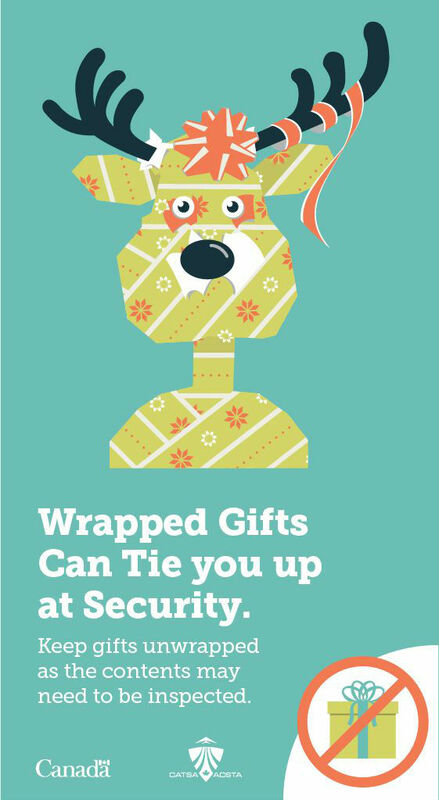 In some airports, gift wrapping services are available after security during the holiday season. Wondering what’s allowed in your carry-on this holiday season? 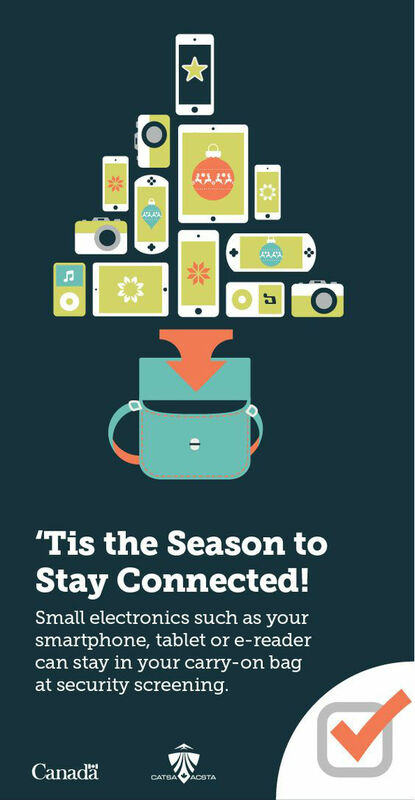 Portable electronic devices are allowed in your carry-on, so feel free to load up your tablet with holiday movies to watch on the plane. However, you may be asked to remove your device’s protective case, and to power it up at the checkpoint. CATSA’s security-screening page has everything you need to know about screening procedures. Does it feel like your immune system is already on holiday? Medications, even non-prescription ones like cough syrup, are permitted in your carry-on, and they’re exempt from the 100-ml naughty-list rule. For more info, check out CATSA’s special medications page. We all know the holidays can be hard on parents, but air travel doesn’t have to be. Things like baby food, juice, formula and breast milk for children under two years old are also exempt from the 100-ml rule, and so are ice packs used to keep them cold. If you’ve checked their list more than twice (take that, Santa), but if you still don’t find the item you’re looking for on CATSA’s What Can I Bring list, you can send a picture or a question to them on Facebook or Twitter. The post How to Survive Holiday Travel through U.S. Airports appeared first on Family Travel Blog - Travel with Kids. So, you’re a regular person and not an extreme athlete or a pro surfer, and thinking of getting a GoPro video camera? Spoiler alert, you probably should. I’m sure everyone has seen those amazing GoPro videos of surfers on a perfect wave, snowboarders carving down a mountain side, bikers taking 50 foot jumps or those extreme athletes jumping out of perfectly good airplanes or the side of a cliff. I love those. Honestly though, if anyone needs a compact, hands free camera, it’s a parent. I find myself wishing daily for another set of arms, so carrying around a big, bulky camera just doesn’t work. So, it’s probably no surprise that we get a lot of questions from fellow parents about the GoPro who want to know is it waterproof? Is it easy to use? How much does it cost? Does it take photos, too? Those are a lot of questions for one tiny camera. So when Sport Chek reached out to us to review the new GoPro HERO 6 Black, we jumped at the chance. It’s a perfect opportunity to answer all of those questions and more. Before we got our new HERO 6, we owned the GoPro HERO4 SILVER. It’s a great little camera and we’ve gotten some great footage the past few years, but I always disliked how we had to keep it in an external casing. That’s changed with the newer GoPros, namely the HERO 5 and Hero 6. Unlike older GoPros (like the GoPro Hero 4 and earlier) the HERO 6 doesn’t need an external case to make it waterproof. This is my favorite feature, as it makes the GoPro HERO 6 so easy and convenient to use, and I never have to worry about putting it in a waterproof case. The GoPro takes great photos and videos. Even better, this tiny camera takes stunning 4K video, which means your family memories will be preserved in stunning detail. 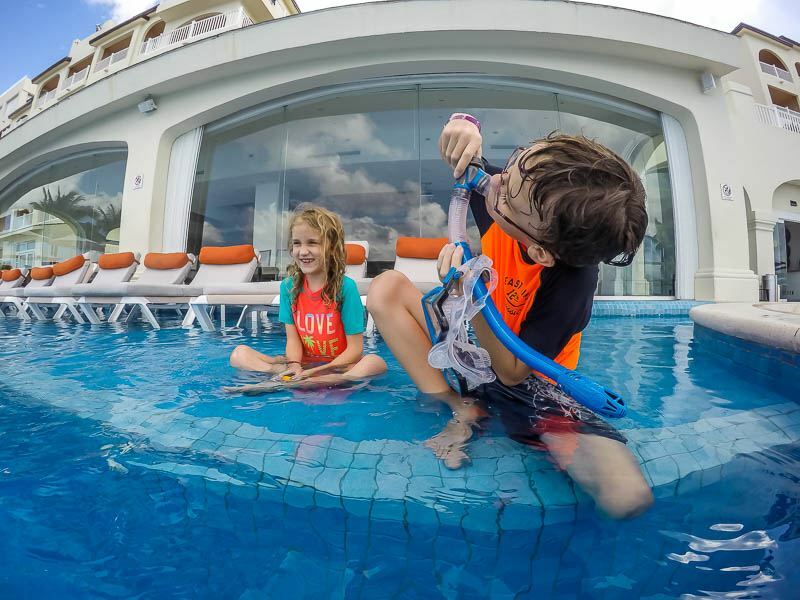 To give it a real try, we took the GoPro HERO 6 Black with us on a early family winter vacation to Mexico and it was the perfect chance to test the GoPro Hero6 in a real world situation. Take a look at the video below, filmed in 4K on our little GoPro HERO 6 Black. The video is raw and unedited, taken straight out of the camera. We didn’t always have the new image stabiliser on (our bad) and we’ve added titles and music, plus cut out some footage, but we haven’t done anything else. The video quality is just a sample of what you’ll get from this camera. There’s a lot to like about this camera, and I’m especially fond of the burst feature for photos. Like a lot of you, I always seem to just miss that perfect moment, like when my kids actually smile at the camera. With the burst mode, I just click the button, and the GoPro takes a burst of photos over several seconds. No more missed photos or that perfect smile. The GoPro HERO 6 is waterproof to 33 meters. We’ve snorkeled with it, played with it in the pool, and even carried it with us as we boogie boarded in the waves. I let the kids carry it around half of the time, and they dunked it in the pool and the ocean dozens of times. Despite all of this, it remained perfectly waterproof. Tip! We use a GoPro floating handle to hold the GoPro. This keeps it from getting lost in the surf, or sinking to the bottom of a pool. Underwater pool photo. Taken with GoPro HERO 6. Is the GoPro easy to use? Well, it’s not hard to use, but using a GoPro is a little different than a smartphone or other camera. If you take ten minutes to learn how to use the GoPro at the beginning, you’ll pretty much know everything you need to. Thankfully, there are only a couple of buttons: a shutter button, and a mode/power button. There’s also a touch screen in back, which makes getting through the menus pretty easy. Unlike the older models, you can see the photos and video as you’re taking them on the LCD screen just like a regular camera. You can also download the GoPro app and connect the GoPro to your smartphone to take remote shots or to easily control all the settings. It can also save the videos and pictures directly to your phone so you can easily share them on Facebook, Instagram and Twitter. The GoPro HERO6 even comes with voice recognition, which we found works really well. Talk about hands free! You can use voice recognition to turn the GoPro on and off, take photos and videos, and a lot more. It really makes mounting the camera to your helmet or chest strap easier than ever. Just tell it when to start and stop recording no matter what your hands are up to. What’s the quality like? Video quality with the GoPro HERO 6 black is an impressive 4K video shooting at 60p, or 60 full frames per second. Those high frame rates per second also mean that it’s excellent at capturing slow motion video. As well as 4K, you can record in 1080p240, 1080p120, or the more classic 1080p60. What that means is that you can still record in high definition and still enjoy top rate quality with varying compression. This means that if space or extended recording is important, you can lower the resolution and not lose a great deal. Taken with GoPro HERO 6. 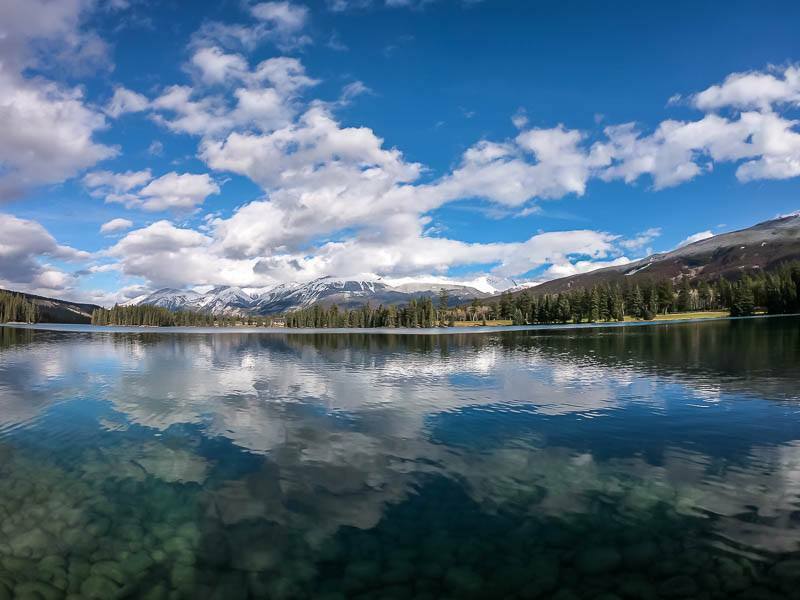 Jasper, Alberta. Here are a few nerdy facts about video compression for you. The GoPro HERO 6 Black uses a new video codec called High-Efficiency Video Coding (HEVC) H.265. It means that the video size can be smaller than the older H.264 protocol, but still retain higher 4K quality. Unfortunately, because H.265 is so new, many video editing software and devices can’t decode its advanced compression at the moment. Luckily, most of the newer Androids and iPhones can play H.265 natively, so wider support is guaranteed as more people get on board with using it. YouTube already supports the new H.265 codec. Taken with GoPro HERO 6. 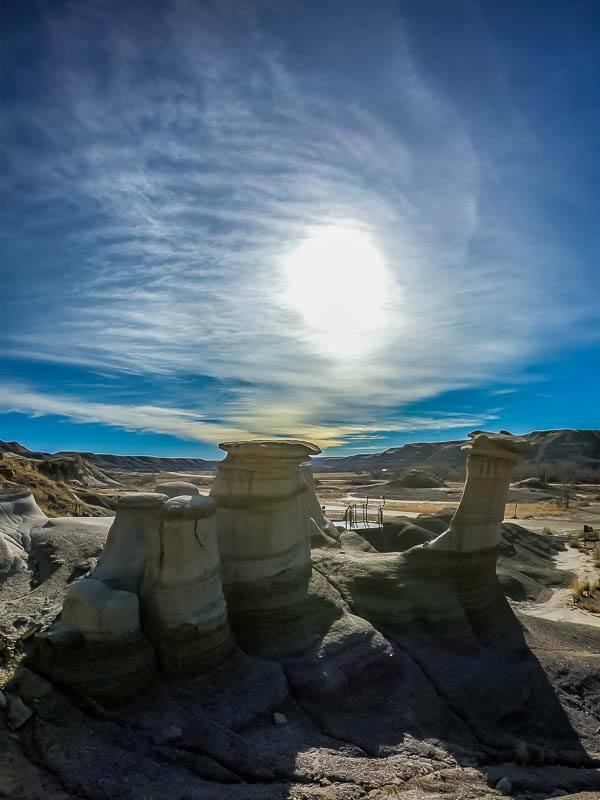 Drumheller, Alberta. The GoPro HERO 6 has digital image stabilization making for steadier video. Because it’s so tiny, we did find that we got some shake when the HERO6 was handheld, but there was less when it was mounted on something like a helmet, or the buoyant floaty handle grip we use. We also didn’t realize that we had turned image stabilization off for part of our trip until we had later watched the videos. For smoother motion, especially when it’s handheld, you’ll want to leave image stabilization on. So is the GoPro for you? Well, if you’re looking for a camera with 4K video, then yes, the GoPro HERO6 definitely does 4K video well and with it’s wide field of view or the new Superview, you won’t be missing anything as long as you have lots of good natural light. 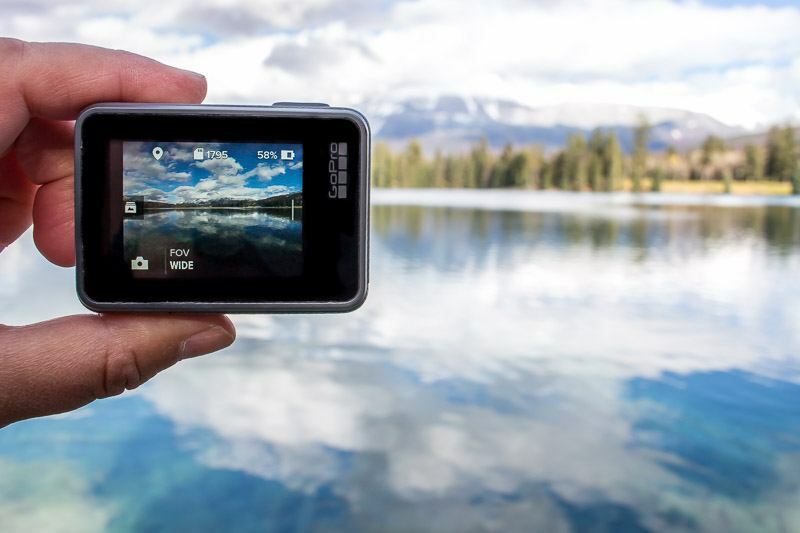 Want a rugged, waterproof camera that you can take almost anywhere? Well, the GoPro HERO6 definitely fits that bill as well. With it’s small frame and rugged waterproof abilities, as well as the built in image stabilization, the GoPro can take what you’re giving and keep on recording. Love playing with new technology? With it’s small touchscreen interface, voice recognition and it’s ability to connect seamlessly with your existing smartphone, the GoPro definitely ticks all the boxes when it comes to new tech. There’s a small learning curve, but it’s nothing that a few minutes watching how-to videos or a little reading can’t cure. The GoPro HERO6 Black HD Action Camera transforms your adventures into incredible QuikStories directly on your phone. 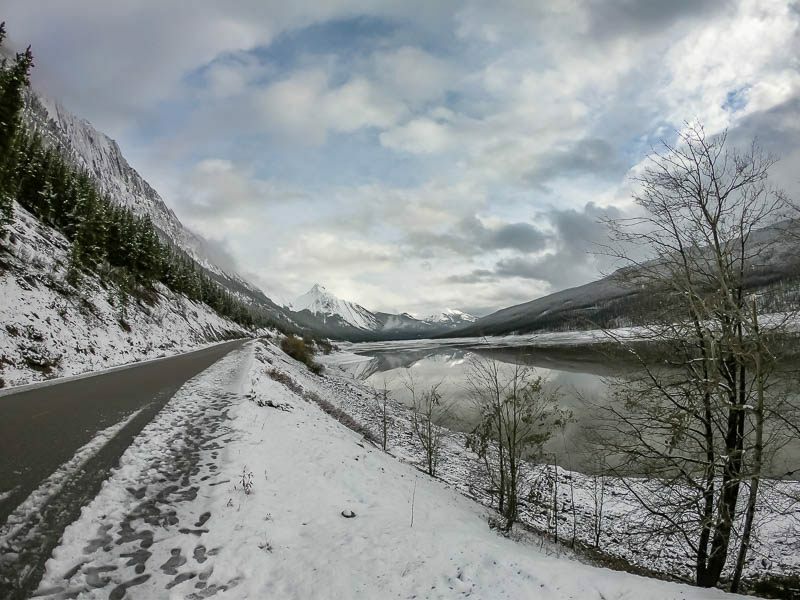 Shopping for a GoPro in Canada? Sport Chek is an official supplier and carries all the latest GoPro devices and accessories. The Platinum Floating GoPro Camera Mount is designed to ensure your GoPro camera floats if you happen to drop it. We use ours every time we take our GoPro in the water. Get 10% off your first purchase and free shipping on orders over $49 if you join the SportChek.ca email list here. Get free shipping on orders $99+ at Sport Chek here ! 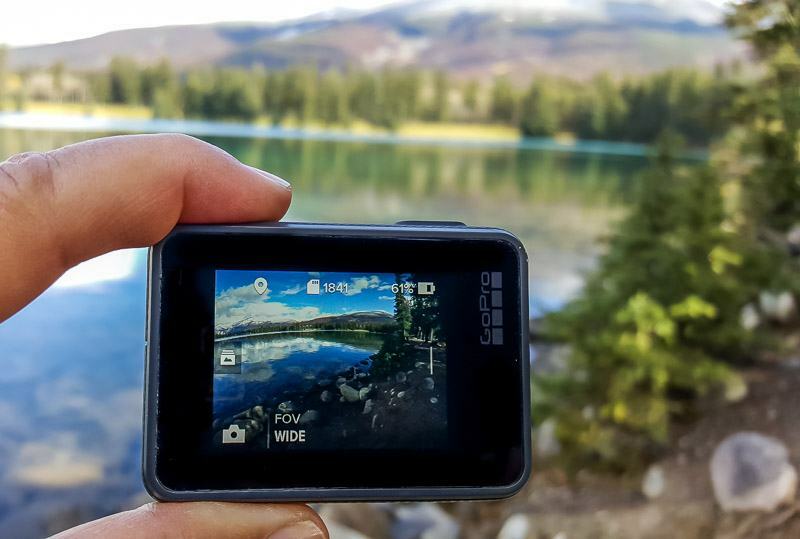 Thanks to Sport Chek for providing us with the GoPro HERO 6 Black for this review. It was on the wishlist and we definitely enjoyed using it. The post Top 10 Things to Do in Dubai with Kids appeared first on Family Travel Blog - Travel with Kids. Today we have a guest post from Chrysoula Manika. She is a fellow travel blogger and tourism professional based in Athens, Greece, so she definitely knows a few things about what to do in Athens with kids. Enjoy! 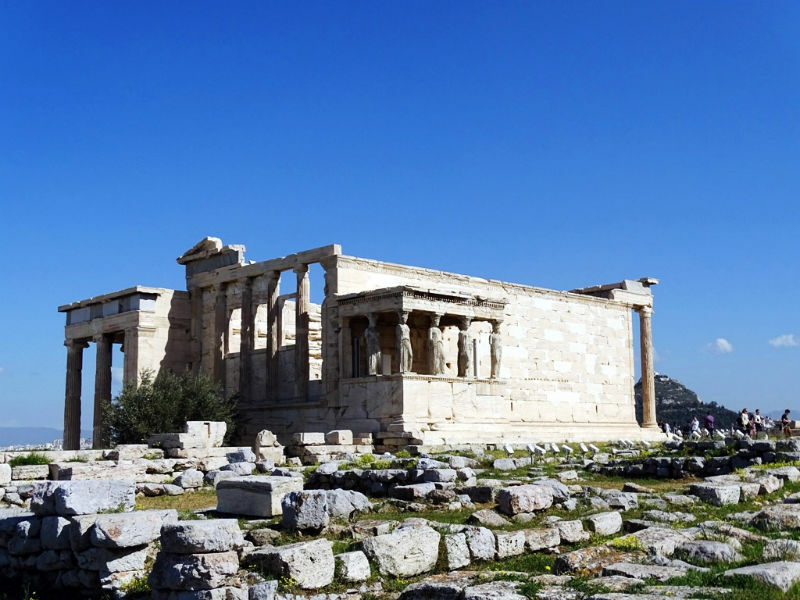 On top of the list and a definite must see when visiting Athens with your family is the Acropolis. Travel back to ancient Athens and show your kids the birthplace of democracy. If you enter the Acropolis archaeological site from the main entrance, you will see not only the world-famous Parthenon but also the Theatre of Dionysus and the Odeon of Herodes. The Acropolis is suitable for children starting from 3-4 years old; it is not easy to use strollers inside the site. Combine your visit to the Acropolis rock with the exhibits in its nearby museum. 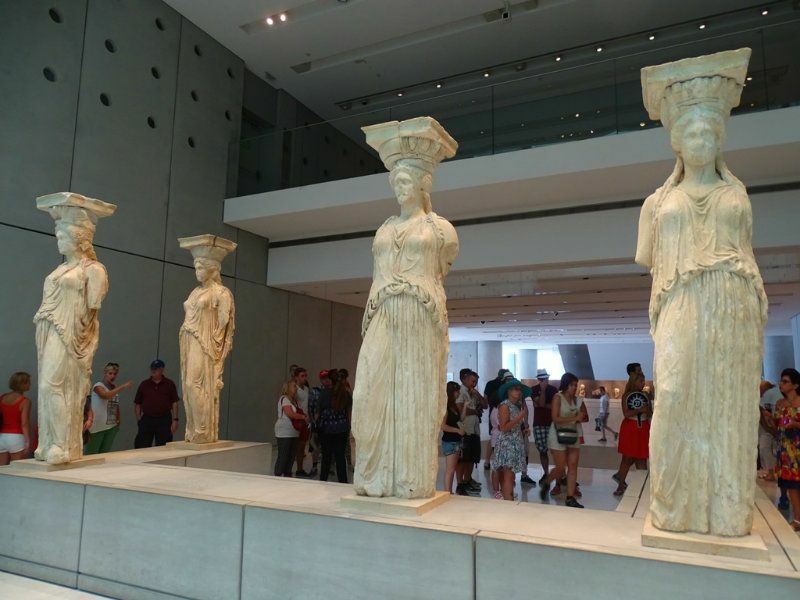 The impressive New Acropolis Museum offers family back packs with educational games and organises family tours. A family-friendly restaurant, a kids’ reading corner and a Lego model of the Acropolis guarantee a fun family day visit. Do your kids love mythology? Then a specialised interactive family tour around the ancient monuments of Athens is a great way to explore the city and its history. 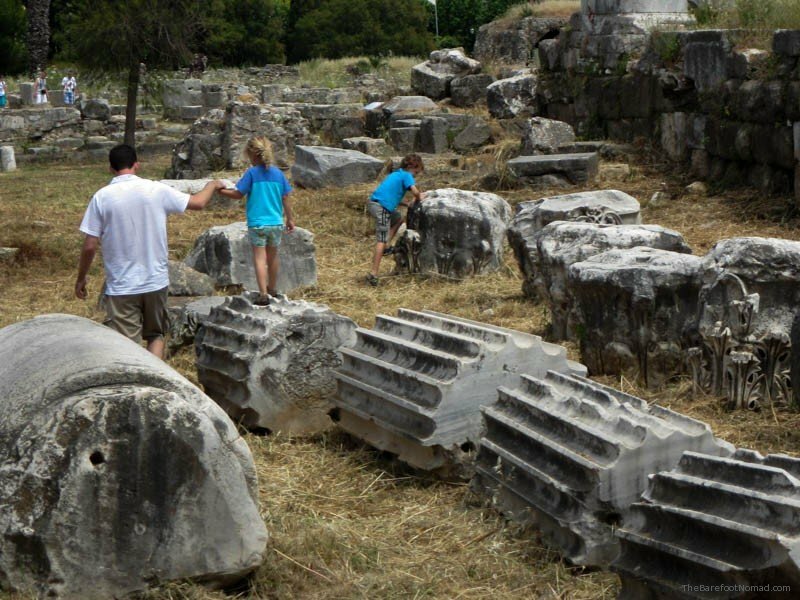 Under the guidance of a dedicated educator, your kids can become actors in the ancient Theatre of Dionysus, picnic in between the olive trees, search for goddess Athena inside the museums or draw like an ancient architect at the Parthenon. These tours are suitable for children from 5 years old. Are the kids tired of walking around or do they just love Thomas the Train? 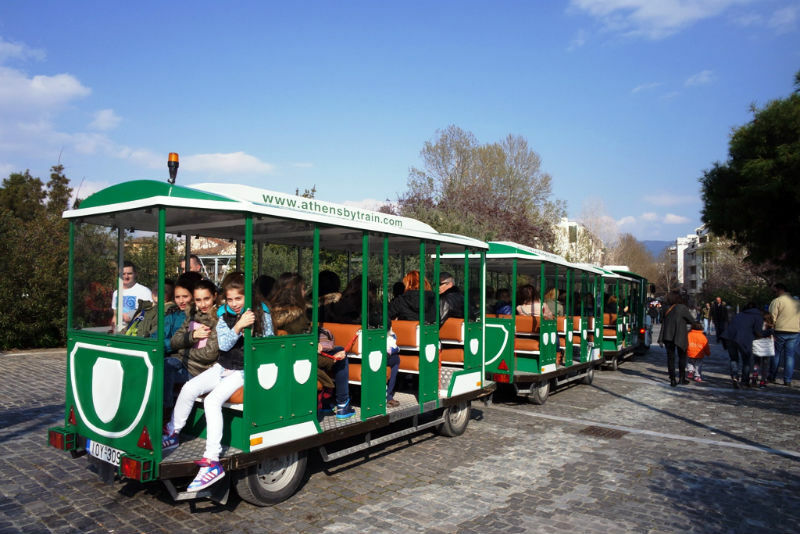 The little red or green toy-like street Athens Happy Train makes a 40 – minute tour in the historical centre of Athens and the most famous ancient sites and monuments. You can hop-on-hop-off from different points in the city and see Athens as you please at your own pace. 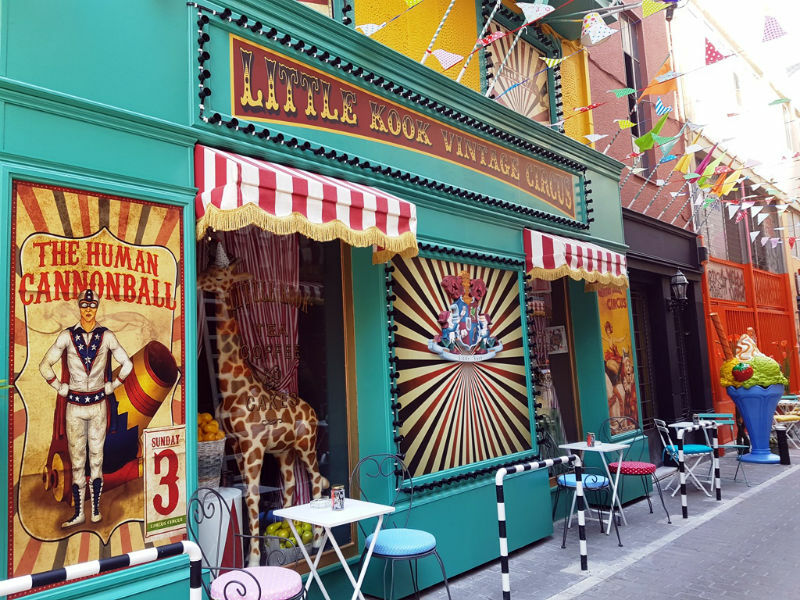 No other place in Athens appeals more to kids than this fairy tale themed cafe in Psiri neighbourhood. Little KooK transfers your family to fantasyland and is amazingly styled around Halloween and Christmas. 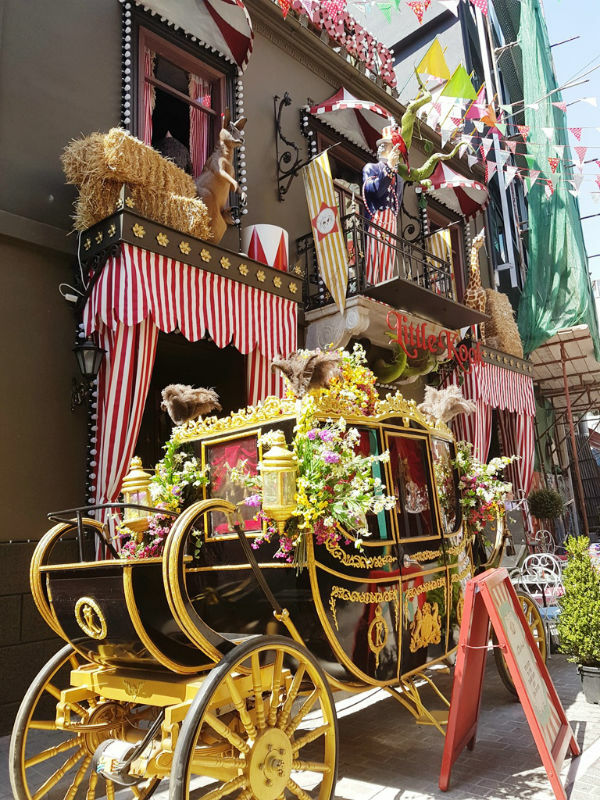 Enjoy delicious cakes and (savoury) crepes in a fairytale setting and don’t forget to wander around the beautifully decorated streets in hip Psiri. A unique experience for all kids and adults is the cable car that goes up Mount Lycabettus. There are also telescopes guaranteeing views as far the island of Aegina. Buy an ice cream at the cafe on top and enjoy a panorama over the city. All children will love feeding the pigeons and watch the impressive changing of the guards at the central square of Athens. 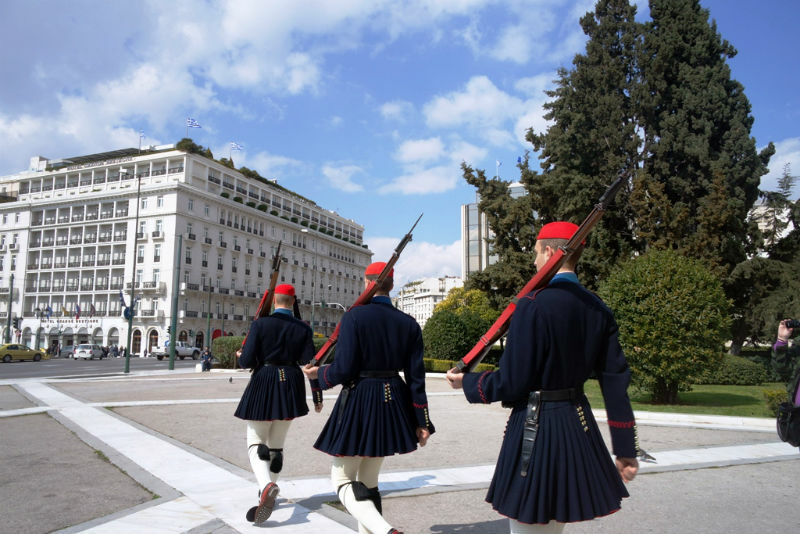 These ‘Evzones’ are members of the Presidential Guards wearing traditional Greek outfits. They stay completely still next to the tomb of the Unknown Soldier outside the Parliament building until the moment that they can move for the change of the guards. For a picnic or an escape from the summer heat, go to the National Gardens or Royal Gardens right next to the Parliament Building. A very stroller friendly place that is also suitable for kids of all ages. 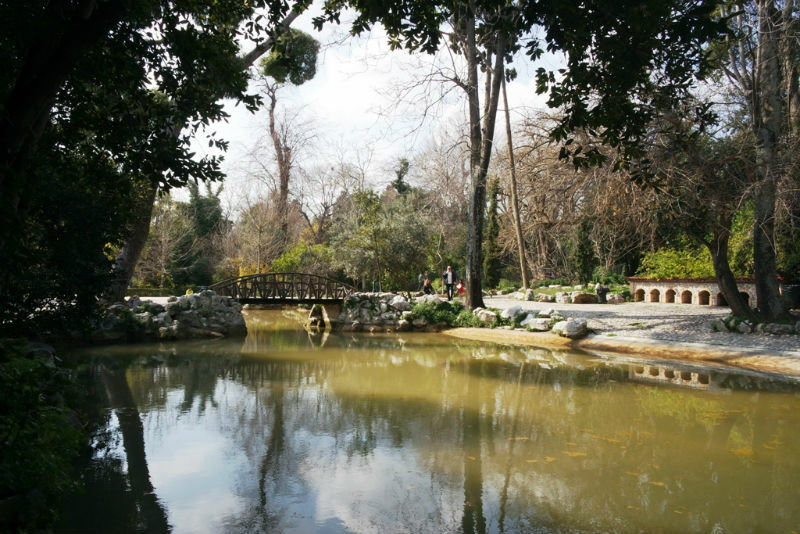 Inside the National Gardens, you will find a small zoo with farm animals, a turtle pond, a large shaded playground, lots of grass areas for babies to play on and a section with botanical gardens. Travelling with teenagers and tired of ancient monuments? Athens has a blossoming street art scene. Many hip neighbourhoods have transformed into an open art gallery with stunning graffiti that places the city into the top places to see street art around the world. 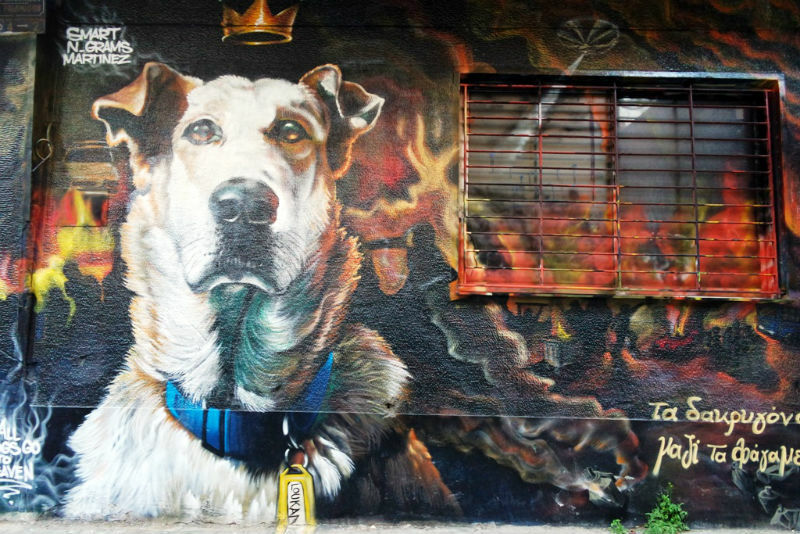 Several tour companies offer guided Street Art Tours. Buy a ‘koulouri’ from one of the street vendors on Syntagma square. Young kids will love nibbling on this healthy large bread-ring with sesame seeds. 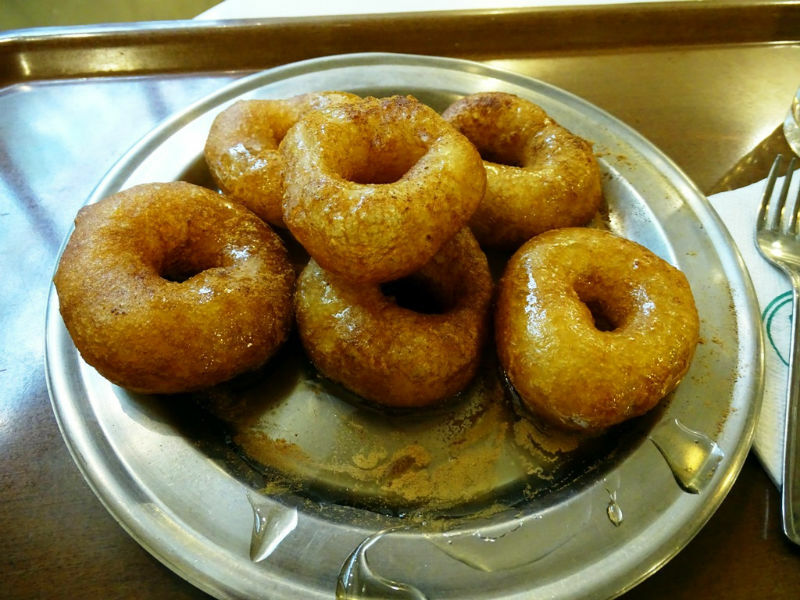 And don’t miss a chance to try ‘loukoumades’, a small Greek doughnut covered with honey. You can find them in any bakery or ‘loukoumades’ shop. Athens is a fabulous place for a family vacation or a weekend trip with kids. It is a safe city to visit with an excellent public metro system, many hotel options, lots of sun and warm winters. Your family will enjoy being outdoors surrounded by historical monuments, good family food choices and easy to visit activities. Chrysoula Manika is a travel blogger and tourism professional based in Athens, Greece. She writes in both English and French for Travel Passionate, her blog focusing on luxury travel around Europe. She’s traveled extensively throughout Europe for the past 25 years and has no intention of slowing down. She loves to explore the local culture and gastronomy of the places she visits. 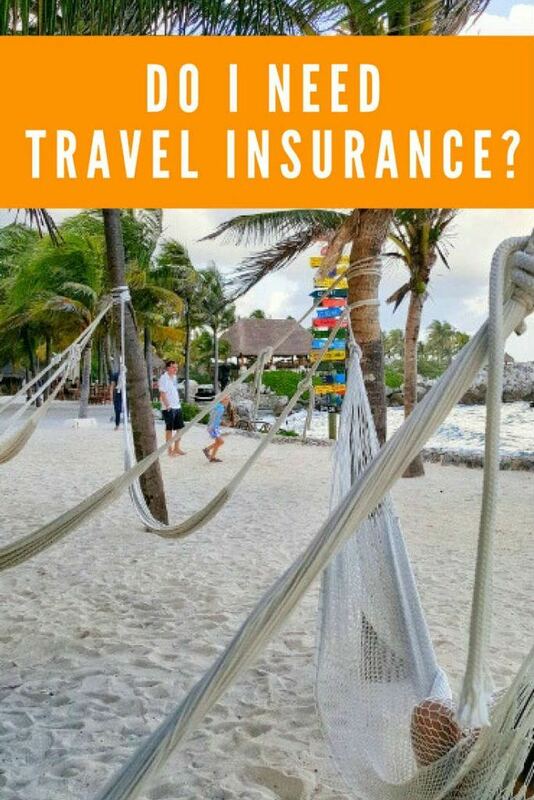 Planning on taking a trip and not sure ifyou need travel insurance? Well, the simple answer is yes, you need it. Travel insurance can give you medical coverage when you’re injured or sick, plus it can reimburse your if your expensive camera or smartphone is broken, if you need to return home if a family member becomes sick or injured, or if your flight is cancelled. We always strongly advise people to get travel insurance. It only costs dollars a day. We’ve seen travel insurance help us and so many other people, and we’ve also seen others regret being cheap and not getting good insurance. 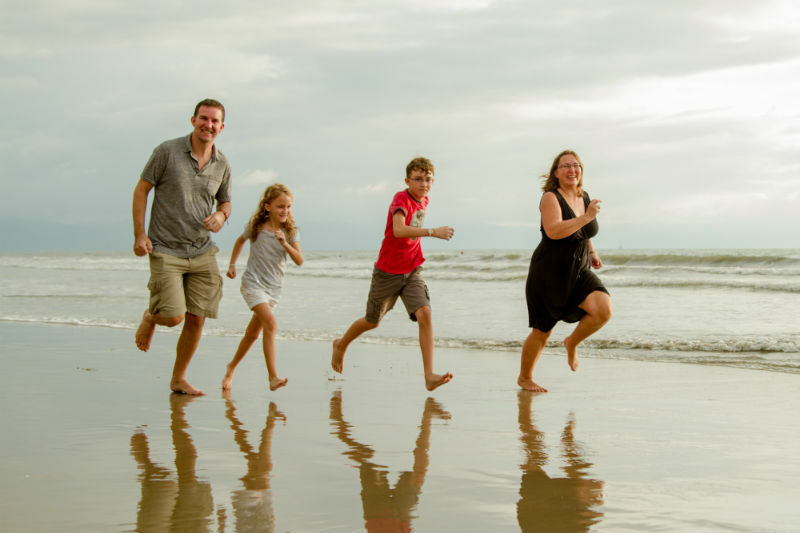 We’ve been grateful for travel insurance when Micki had a three day hospital stay in Thailand, when our son needed stitches for his ear in Greece, and when we needed the addresses of the nearest hospitals in Quito, Ecuador. So why do you need travel insurance? The same reason you need car insurance, home insurance and so forth. It’s insurance, something you need to insure that you don’t lose everything else you have in your life in case something bad happens. Without it you open yourself to a lot of unnecessary risk. Now, you might be thinking, how much can it cost me if I don’t have travel insurance? I mean, you’ve traveled dozens of times and haven’t needed it. Why should you bother giving your hard earned money to some travel insurance company? Simple, no one plans for an accident to happen, that’s part of the definition of an accident. If you haven’t needed to use your travel insurance on previous excursions out of country then consider yourself fortunate. If you travel often, the odds are that sooner or later you’ll need it and hospital stays in foreign countries can easily cost you tens of thousands of dollars. So what exactly is travel insurance? It’s a hedge bet that something will happen on your next trip that you’re not prepared for. It might be a stolen phone or camera. It could be a sudden case of a nasty flu or it could be that a car swerves and hits a truck that unleashes a herd of geese that distracts a driver that nearly hits you and, as you back away, you fall down a flight of stairs. Now, it wasn’t the fall that hurt you, it was slipping on the ice at the bottom as you were dusting yourself off that broke your arm while you were trying to grab the handrail. The bad part is that you need to use your arm when you get home and it’s going to take 6 weeks to heal. Sound too far fetched? Maybe, but that’s the nature of accidents. If they were planned, they’d be called on purposes. So yes, accidents happen, at home or abroad. It’s called life and it’s not simple, clean or easy. We’ve been fortunate the we only needed travel insurance a few times over the course of our travels, but it’s still something we firmly believe every traveler should carry. Not only can a good travel insurance plan give you piece of mind, the company behind it can often help guide you to a good doctor, they can help with your emergency return to your home, pay for follow up treatments in case it’s warranted, cover your lost or stolen goods, cover your cancelled flights and even pay for your hospital bills. They can also provide money to your family should you not make it back home. Not something people like to discuss but it’s a reality whether you’re getting in the car to go to work or getting on a plane and heading to Rio. Leaving enough so your family can properly do what they need will make their lives easier in times of loss and there’s no price too high for that. So now that you’ve decided you need travel insurance, what are your options? The good and bad side are that there are tons of options to choose from. Not only are there hundreds of companies and brokers, there are single trip plans, multi trip plans and comprehensive plans. Plans that have deductibles and plans that are deductible free. There’s cancellation insurance, liability insurance even dismemberment insurance. There are evac only plans, hostage and negotiation plans and even natural disaster only plans. Amid all that there are different price points for each plan. So I ask again, how do you choose your travel insurance? The hard truth is there is no simple way to choose travel insurance. You need to decide which factors are the most important to you and how much you’re willing to pay for each service because the fact is, the more comprehensive the travel insurance, the more it’s going to cost you. Doesn’t seem fair? Well, think of it from the company that’s insuring you’s side. It’s no secret they’re into this business to make money. That’s why they have actuarial tables and the risk each person faces and the likelihood that they’ll have to pay out in case an accident occurs. They can’t offer more services without charging for it. On the other side of the fence we have people that often over buy insurance. They get enough insurance that if they have to make a claim they equate it to winning a lottery. That’s not right either. To us, the purpose of travel insurance is to mitigate as much risk as possible while also realizing that sometimes bad things happen. However, just like I don’t make my kids walk around in helmets in the odd chance they fall and hit their head, so too don’t I rely on insurance to make my life better. In this way we often plan for the worst case scenario and no matter the outcome we know we’ll be at a loss when it comes to travel insurance but our family on the whole will survive. To us that often means getting a good insurance plan with a reputable company with a little less bells and whistles than we’d need. We save on fees a ton that way, like by including a deductible on our plans. We know we don’t often end up using our travel insurance and having a deductible often lowers our initial cost. That said, we know that if we do have to make a claim it will cost us a few hundred dollars. This also ensures that if we really need to use our insurance it has to be worth it. To give you a good example, while we were in Greece a few years back, our son slipped on a merry go round and tore his ear wide open. Seeing as Greece was in economical turmoil, the hospital was closed down so we walked to the private hospital service across the street. For $180 dollars they had him sewn up and as good as new in a few hours. Now, we could have filed a claim, but however considering our deductible was $200 there was no point. That was an acceptable cost to us and didn’t really affect us monetarily in a big way, however had he severely injured his leg, we would have happily paid the deductible and considered ourselves fortunate that we had travel insurance. So what’s the purpose of that story? 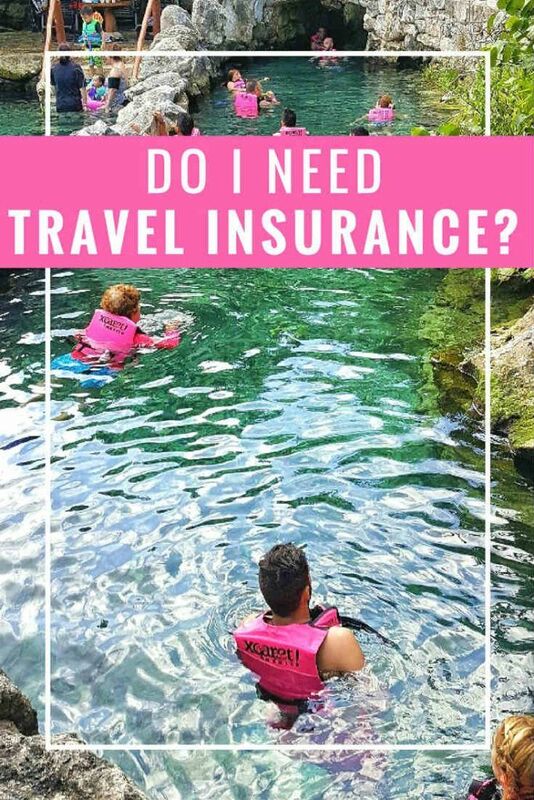 It’s to affirm that yes, accidents happen everywhere as well as to highlight that every traveler has their own needs and what’s acceptable to them when it comes to travel insurance. It’s up to you to decide what’s right for you and your family. If having your bags lost or stolen worries you, get baggage insurance. If you never file claims, consider increasing your deductible to save a little money. If you travel often, especially for short periods, consider getting a multi trip plan since it will save you in the long run and you won’t be having to buy travel insurance every time you leave the country. Just like every traveler is unique, so is every travel insurance plan. Make sure you compare your plan with others before deciding which one is right for you. 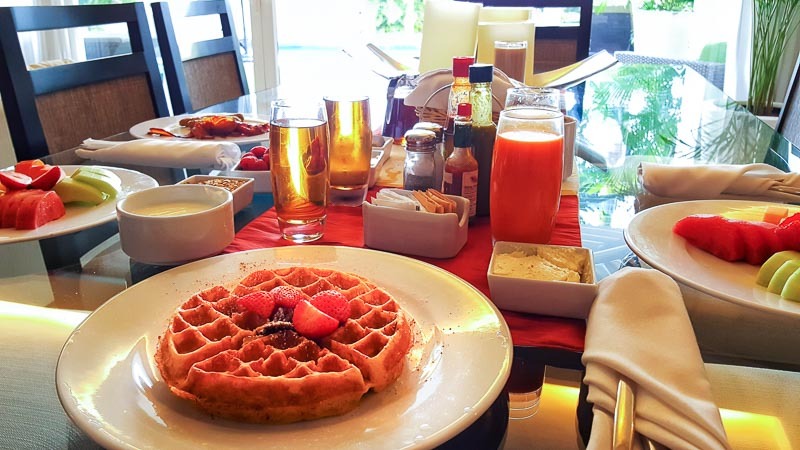 The post Top 5 Cafes with Internet in Cabarete, Dominican Republic appeared first on Better Than a Hotel – Cabarete Palm Beach Condos.